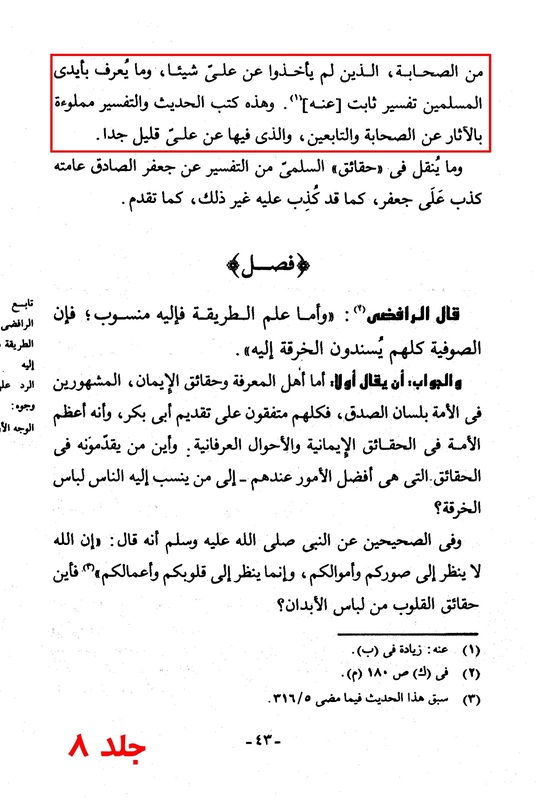 The purpose of this article is to merely demonstrate how the so-called, 'Ahl us Sunnah Wal Jammah' whilst claiming to adhere to the teachings of the Ahlulbayt (a.s) have in fact taken nothing from them. 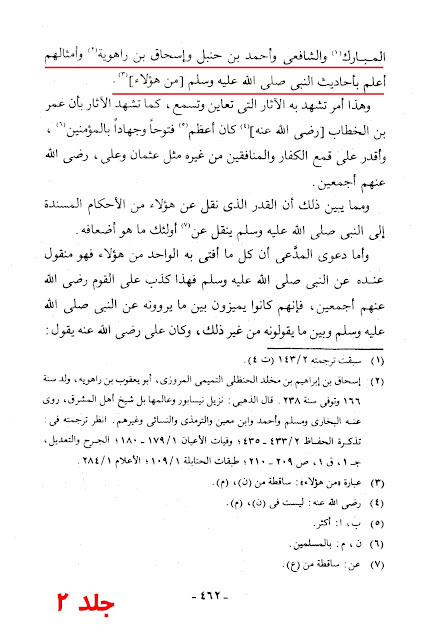 The Shi'ee have adopted a creed which differs from the Sunnis in which theological reasoning has led to adherance of those Imams (a.s) who belong to the family of the Holy Prophet (saw) and his immediate offspring. These blessed individuals (peace be upon them all) understood the Sunnah of the Prophet (saw) better then anyone else. Thus, for this very reason, the followers of the Ahlulbayt (a.s) have wholly and solely bound themselves to them in their observances, beliefs and taken their (a.s) derivations of knowledge of the Qur'aan and Sunnah of the Prophet (saw). "We do not accept that the Imamiyyah take their religion from the Ahlulbayt (a.s), neither the Ithna Ashariyyah nor others. 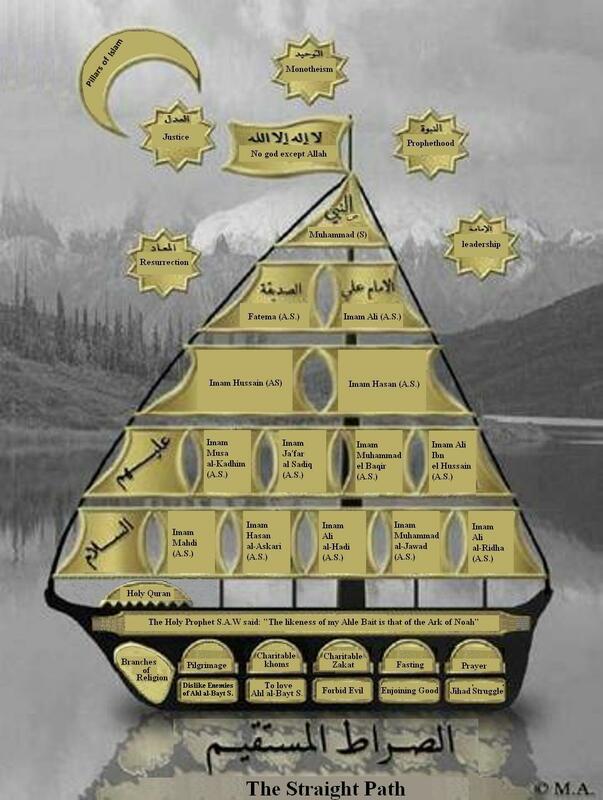 Rather, they are opponents of Alee (a.s) and the Imam's of the Ahlulbayt (a.s) in all the fundamental beliefs in which they differ with the Ahl ul Sunnah wa al Jamaah, and in their Tawheed, their belief in Adalah (divine justice), and their belief in Imamah. 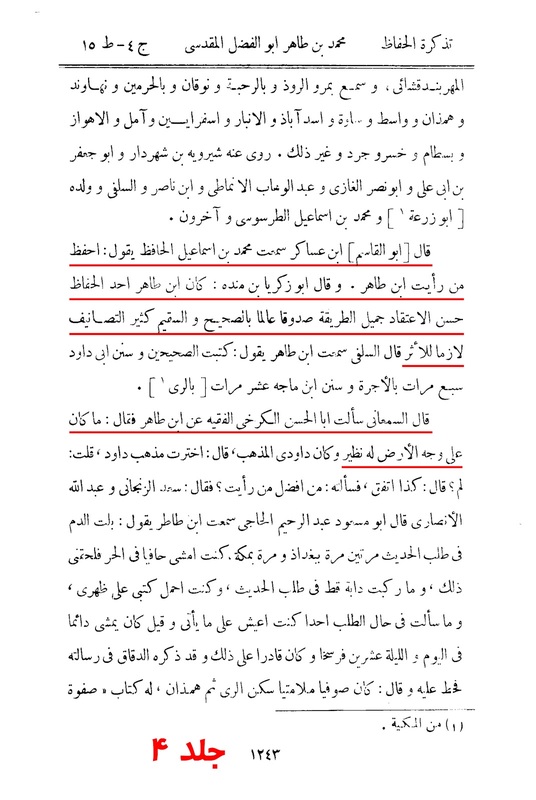 While it is well concluded that Alee (a.s) and the Imams of the Ahlulbayt (a.s) believed in the Attributes of Allah (swt) and destiny, not to mention in the leadership of the three Khalifahs, and in the superiority of Aboo Bakr and Umar and others in all the questions. They contradict the Shi'ee. 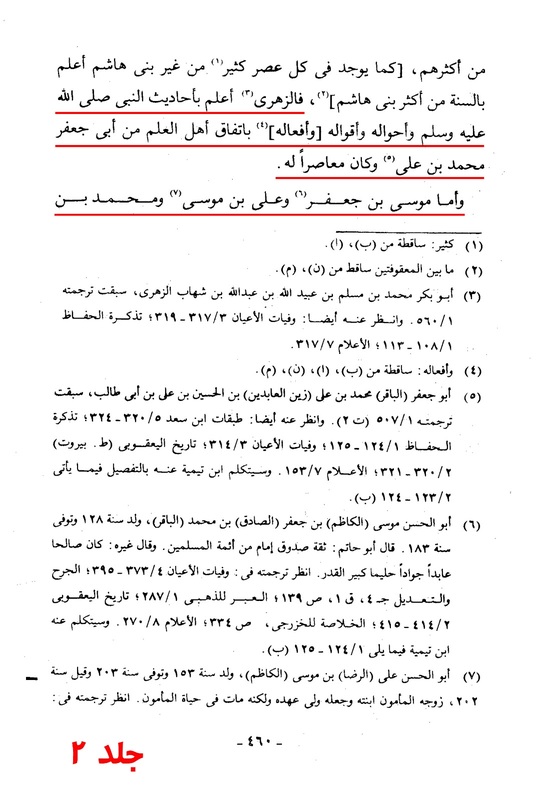 The evidence of this are firmly concocted in the books of the scholars, in that the proofs in this aspect from the Imams of the Ahlulbayt (a.s)necessitate certain knowledge that the Rafidah are opponents to them, and not their followers." Source: Minhaj Al-Sunnah. Vol. 4, Pg. # 16 - 17. 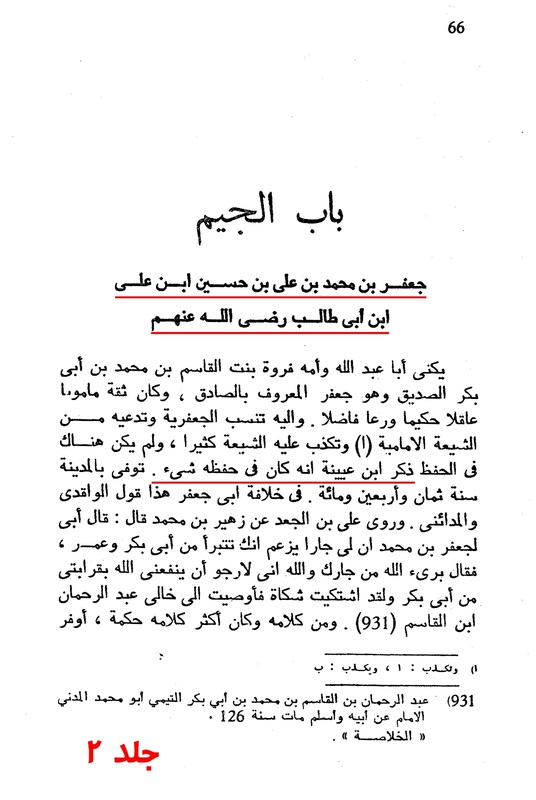 Ibn Taymiyyah has made rather bold claims by suggesting that the so-called 'Ahl us Sunnah' follow the Aimma (a.s) in regards to their fundamental doctrine, such as Tawheed, Divine Justice, Leadership and in all other elements of faith. In his view, the 'Shi'ee Imami' do not follow the Ahlulbayt (a.s) in anything! Each area would require a great deal of analysis and Insha'Allah Ta'ala we can investigate these subjects in future articles. However, let us look at the reality behind such a statement. And likewise, most of the Imams of the people of Hadeeth like Malik, and Shi'ba, and Al-Thawri, and Ahmad bin Hanbal whoever knows their case knows a certain knowledge that they absolutely do not believe that any lie has occurred in the narration of the Prophet (saw) and they know that they (i.e. the narrators) do not commit mistakes except for one or two pronounciations. And from among them there are some who knows that he would commit mistakes in the Prophetic narration, for Ahmad bin Hanbal absolutely knew that he would commit mistakes in it, but neither Al-Thawri or Al-Zuhri did, and so did a lot of people other than them. And those who know that they would commit mistakes like Himad bin Salama and Jaffar bin Muhammad (Imam Jaffar Sadiq (a.s)) would know that their mistake would be something that would pass on and would be in occasions they would know. Source: Jawab Al-I'tiraadhat Al-Masriya 'Alal-Futya Al-Hamawiya. Pg. # 42. 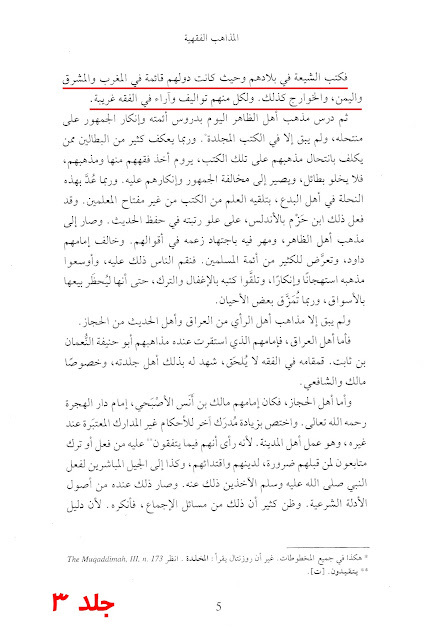 "No doubt what the jurists narrate from Aboo Hanfia, Malik, Al-Shafi, Ahmad and others are more correct than what the rafidis narrate from the two Askari and Muhammad bin Alee Al-Jawad (a.s) and others, and no doubt that they (Aboo Hanifa etc.) are more knowledgeable in the religion of the Prophet (saw) than those (Al-Jawad (a.s) etc)." 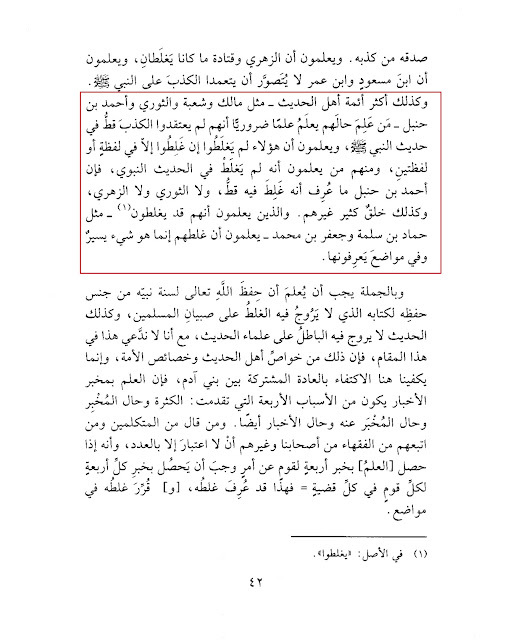 Source: Minhaj Al-Sunnah. Vol. 2, Pg. # 476. "Verily Al-Zuhri is more knowledgeable about the Prophetic hadeeths, statements and actions than Aboo Ja'far Muhammad bin Alee (a.s) and the scholars agreed on that, and (Al-Zuhri) was a contemporary to him (Imam Al-Baqir (a.s)). 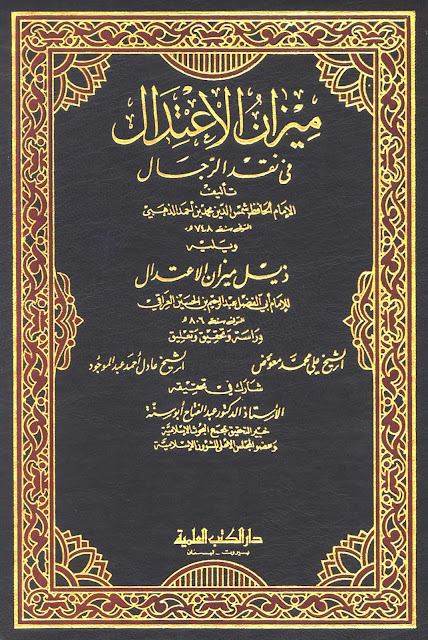 However, regarding Musa bin Jaffar (a.s), Alee bin Musa (a.s) and Muhammad bin Alee (a.s), no one among those who possess knowledge doubt that Malik bin Anas, Hamaad bin Zaid, Hamaad bin Salama, Al-Laith bin Sa'ad, Al-Awzaei, Yahya bin Sa'eed, W'akei bin Al-Jarah, Abdullah bin Al-Mubarak, Al-Shaf'i, Ahmad bin Hanbal, Ishaq bin Rahwei and others were more knowledgeable about the Prophetic hadeeth than them." 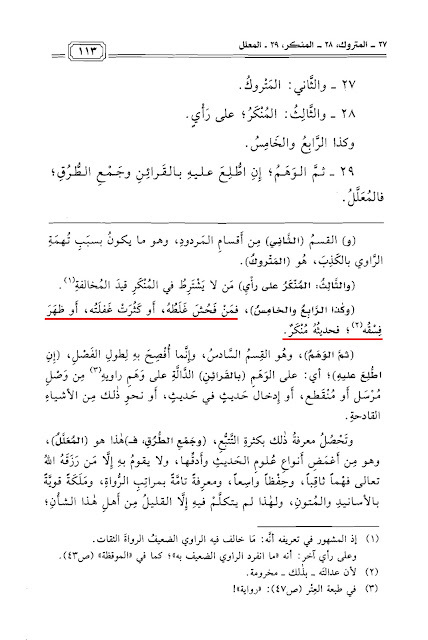 Source: Minhaj Al-Sunnah. Vol. 2, Pg. # 460 - 461 - 462. 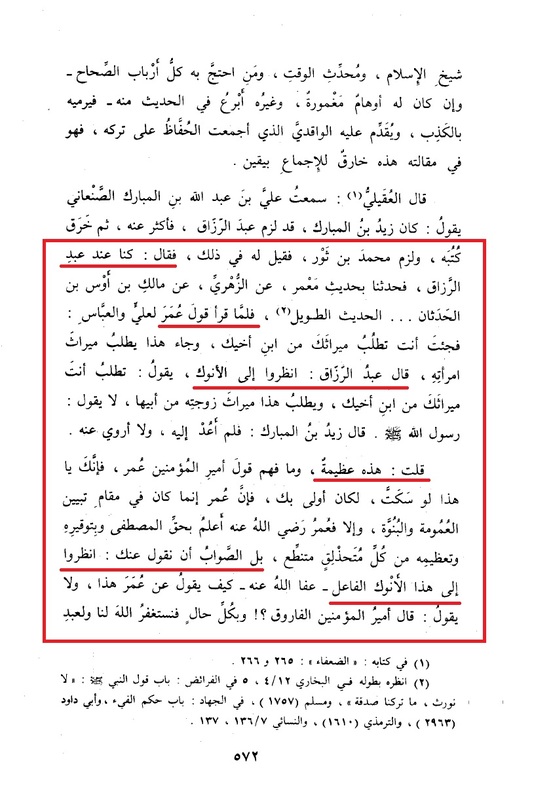 Regarding Al-Bukhari: "He had doubts over him (regarding Imam Jaffar Sadiq a.s) due to the criticism levelled at him by Yahya bin Sa'eed Al-Qattan." Source: Minhaj Al-Sunnah. Vol. 7, Pg. # 533 - 534. 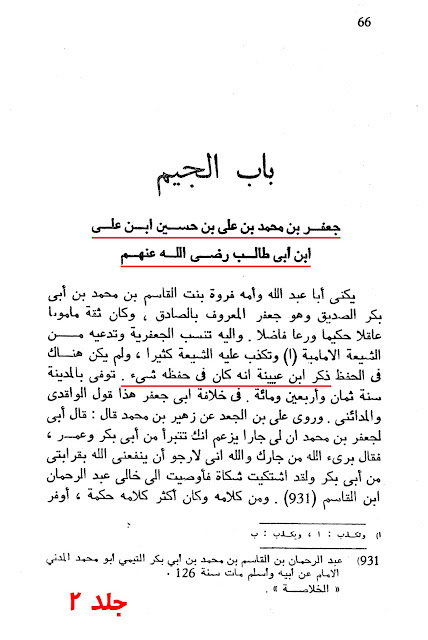 Despite the fact Bukhari himself did not narrate any Hadeeth from Aboo Hanifa, why did ibn Taymiyyah fall short of mentioning that? The level of criticism does not fall short on Imam Sadiq (a.s) alone, rather it extends to other Imams of the Ahlulbayt (a.s). 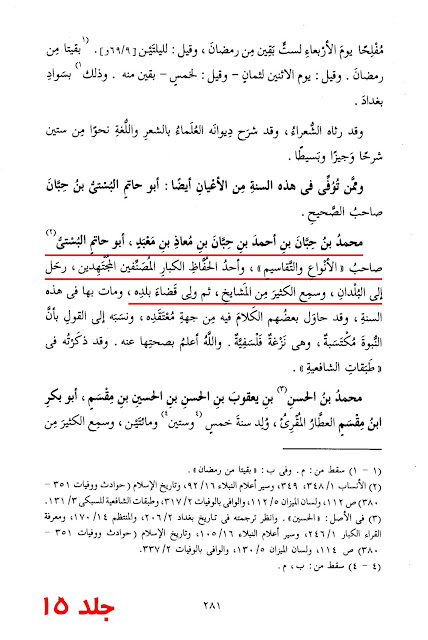 It is for this very reason we find very few narrations in the Saheeh Sittah from them. "Alee bin Al-Hussain (a.s), his son Aboo Jaffar (a.s) and his son Jaffar bin Muhammad (a.s) taught people what Allah (swt) taught them in the same manner that (Allah (swt)) taught the other scholars during their lives. Verily there were people during their lifetimes that were more knowledgeable and more useful for the nation than them." 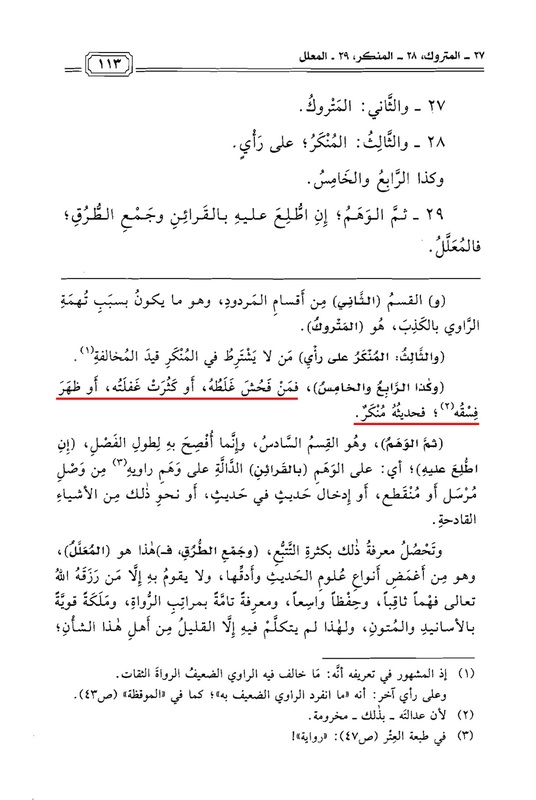 Source: Minhaj Al-Sunnah. Vol. 4, Pg. # 387. Subhan Allah! 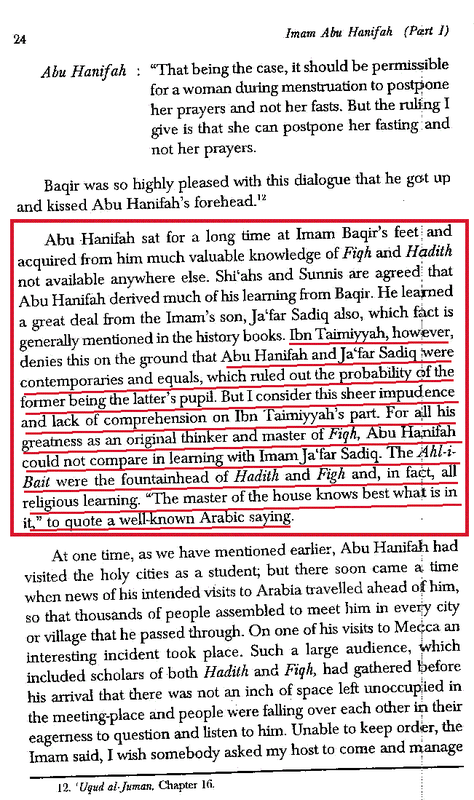 Despite the fact Aboo Hanifa is deemed worthless, ibn Taymiyyah still regards him more learned then the Imams of the Ahlulbayt (a.s)! 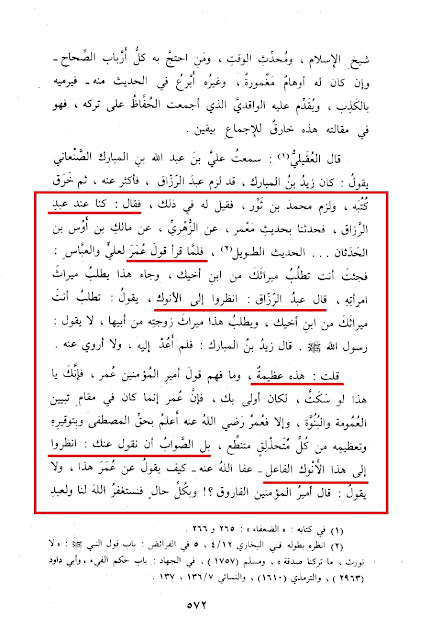 "Aboo Hanifa sat for a long time at Imam Baqir's (a.s) feet and acquired from him much valuable knowledge of Fiqh and Hadith not available anywhere else. 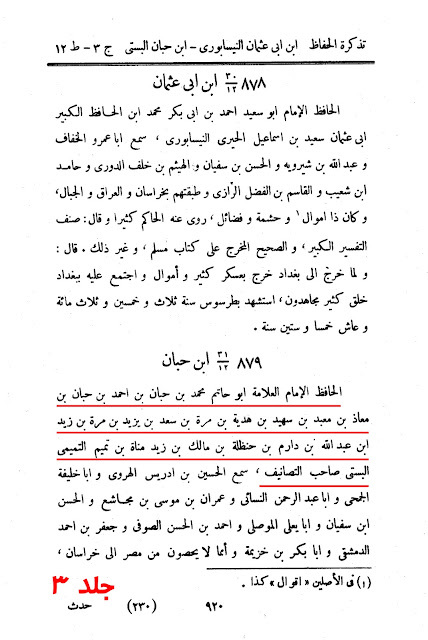 Shi'as and Sunnis are agreed that Aboo Hanifa derived much of his learning from Baqir (a.s). He learned a great deal from the Imam's son, Ja'far Al-Sadiq (a.s) also, which in fact is generally mentioned in the history books. Ibn Taymiyyah, however, denies this on the ground that Aboo Hanifa and Ja'far Al-Sadiq (a.s) were contemporaries and equals, which ruled out the probability of the former being the latter's pupil. But I consider this sheer imprudence and lack of comprehension on ibn Taymiyyah's part. 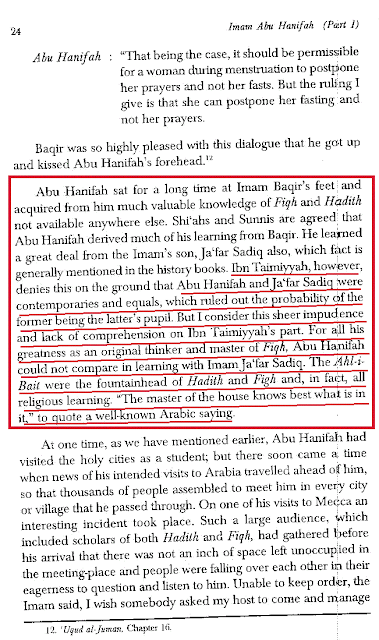 For all his greatness as an original thinker and master of fiqh, Aboo Hanifa could not compare in learning with Imam Ja'far Al-Sadiq (a.s). The Ahlulbayt (a.s) were the fountainhead of Fiqh and Hadith and, in fact, all religious learning. "The master of the house knows best what is in it," to quote a well-known Arabic saying. Source: Imam Aboo Hanifah. Life And Works, Pg. # 24. Aboo Hanifa and Malik were the students of Imam Saddiq (a.s), and Aboo Hanifa used to say: "Without the two years Al-Nu'man would have perished." 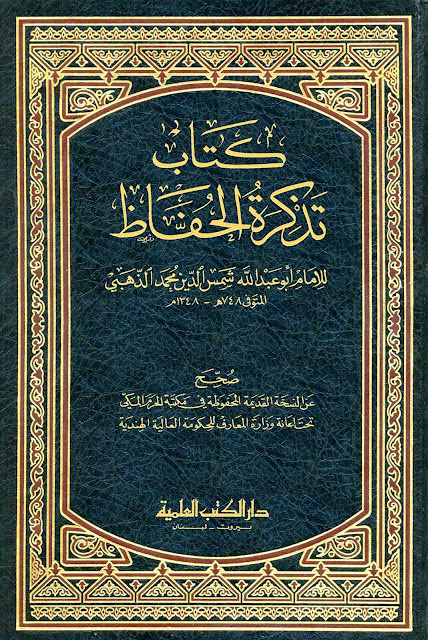 Source: Aima Al-Fiqh Al-Tisa. Vol. 2, Pg. # 51. 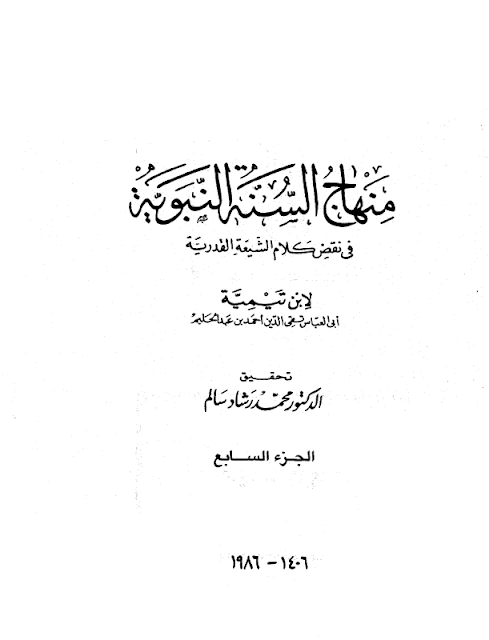 The ignorance of ibn Taymiyyah's statements has in fact cast doubts on the teachers of the present day Sunni Imams. If this is the condition of the teacher, what will be the position of his students? 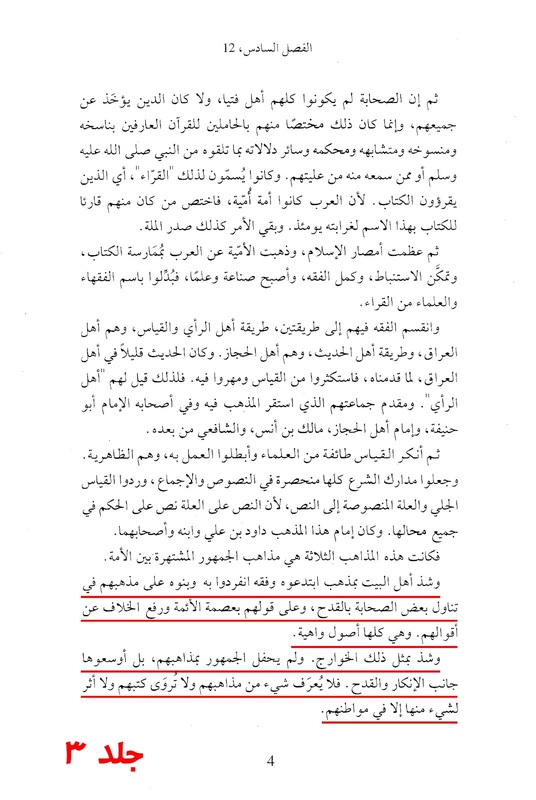 "Each one of those (i.e The Sunni Scholars) were more knowledgeable than the two Askaris about the religion of Allah (swt) and His messenger (saw) what is wajib for the people like the two Askaris is to learn from one of those (Sunnis)." 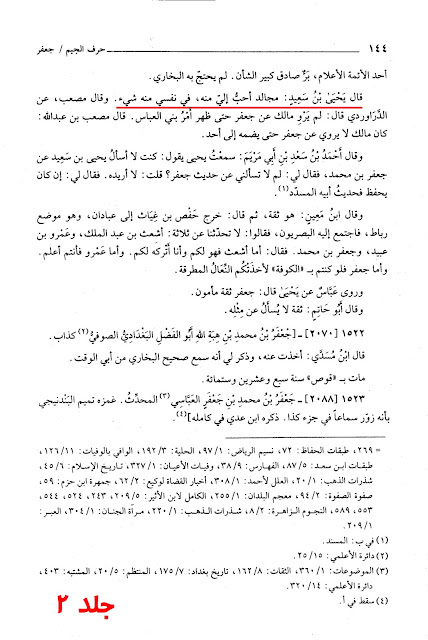 Source: Minhaj Al-Sunnah. Vol. 2, Pg. # 472 - 473. 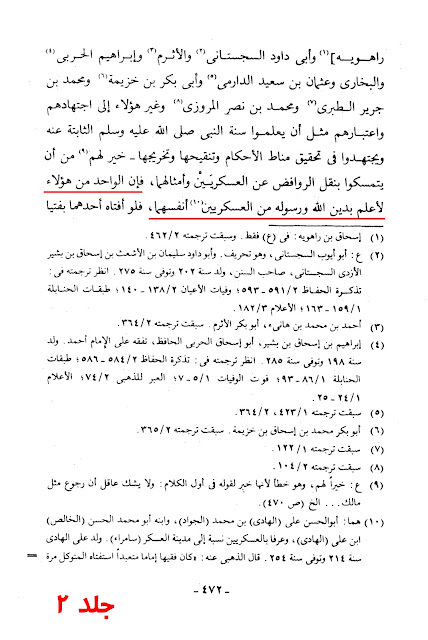 None of the four Imams nor the other of the jurists refer to him (Alee (a.s)) in their jurisprudence, verily if Malik's knowledge was obtained from the people of Madinah, the people of Madinah did not take Alee's (a.s) statements, they take their jurisprudence from the seven jurists, Zaid, Umar, ibn Umar and so on. 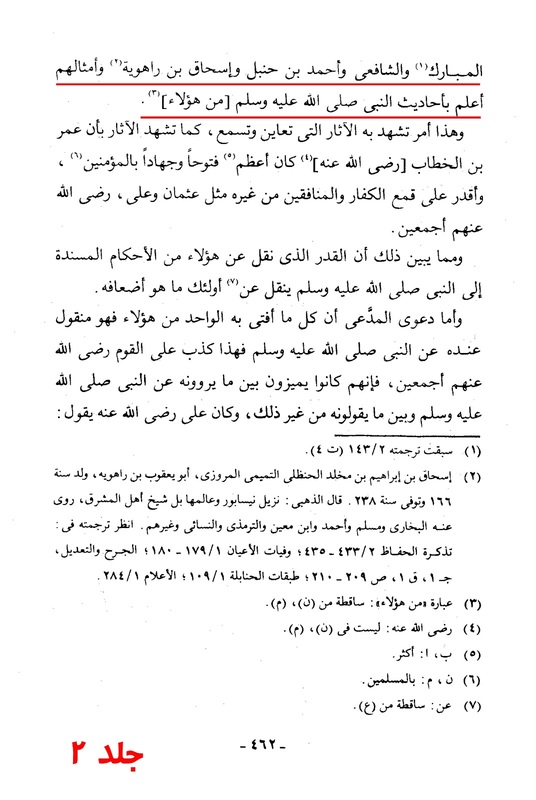 Shaf'i obtained jurisprudence from the people of Makkah, the companions of ibn Juraij like Sa'eed bin Salem Al-Qadah and Muslim bin khalid Al-Zenji. 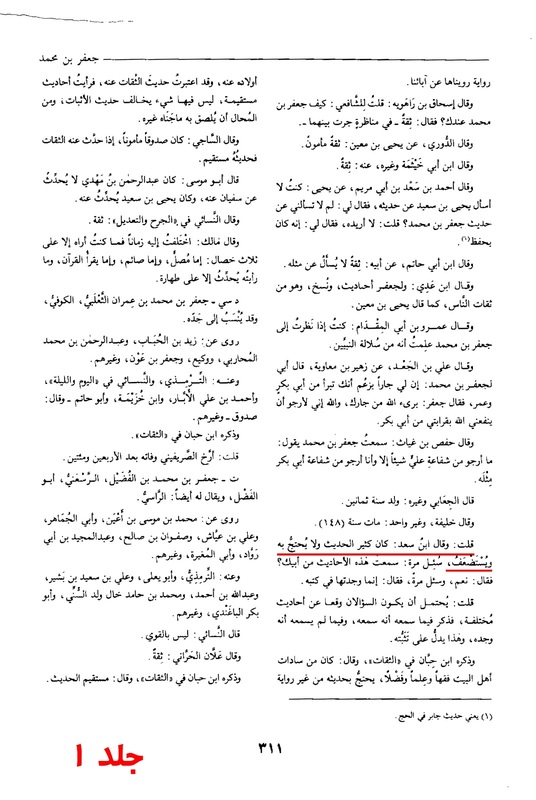 Ibn Juraij obtained knowledge from the companions of ibn Abbas, like Atta and others, verily ibn Abbas was an independent mujtahid, whenever he gives fatwa, according to the sahabas he would give the fatwa of Aboo Bakr and Umar, not Alee's (a.s). He disagreed with Alee (a.s) on few things. 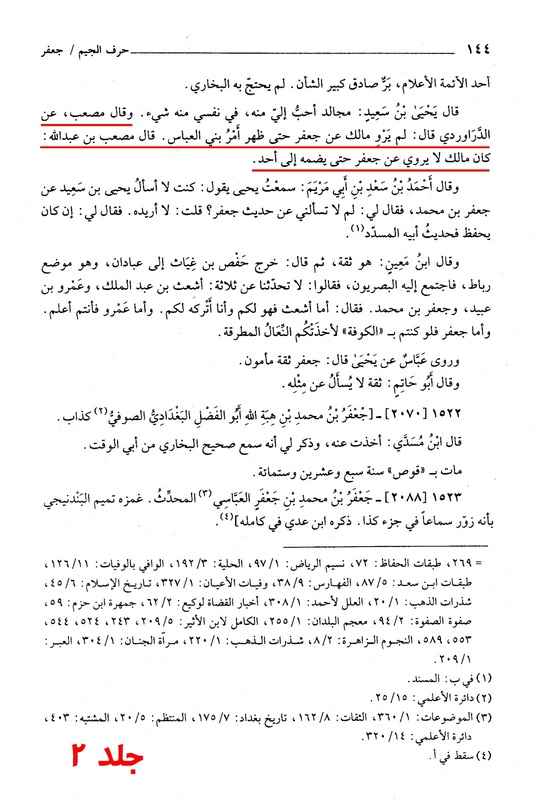 Source: Minhaj Al-Sunnah. Vol. 7, Pg. # 529 - 530. 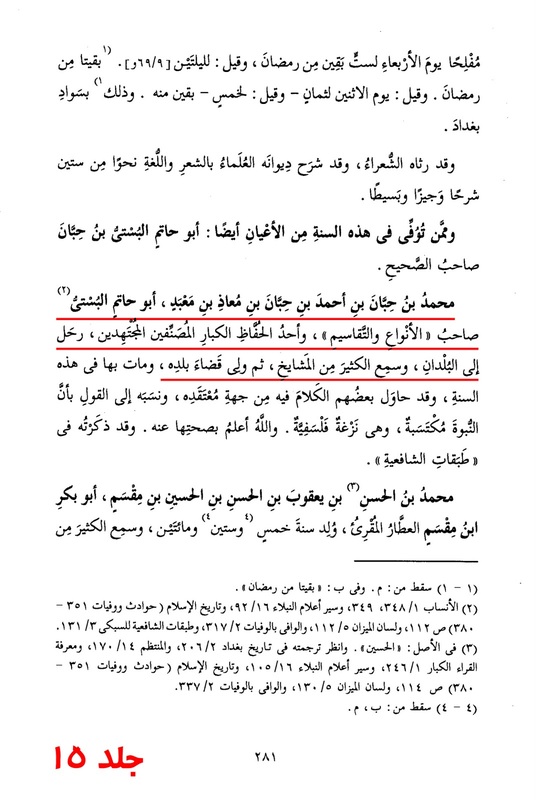 Moreover, the Tafsir (commentary) that was not taken from ibn Abbas was taken from ibn Mas'oud and others from the Sahabah, those who did not take anything from Alee (a.s). 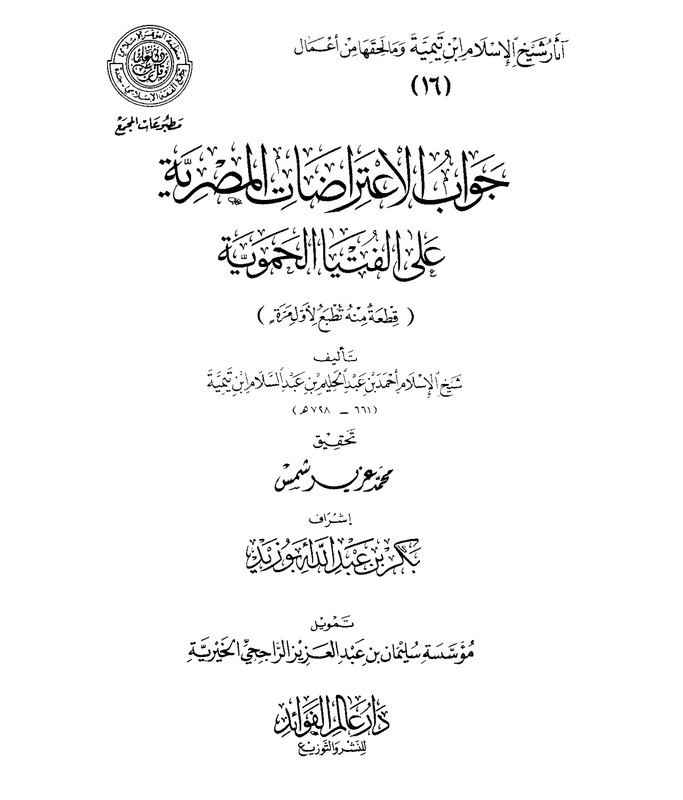 There is no known reliable Tafsir in the hands of the Muslims that comes from him (i.e. Alee (a.s)). 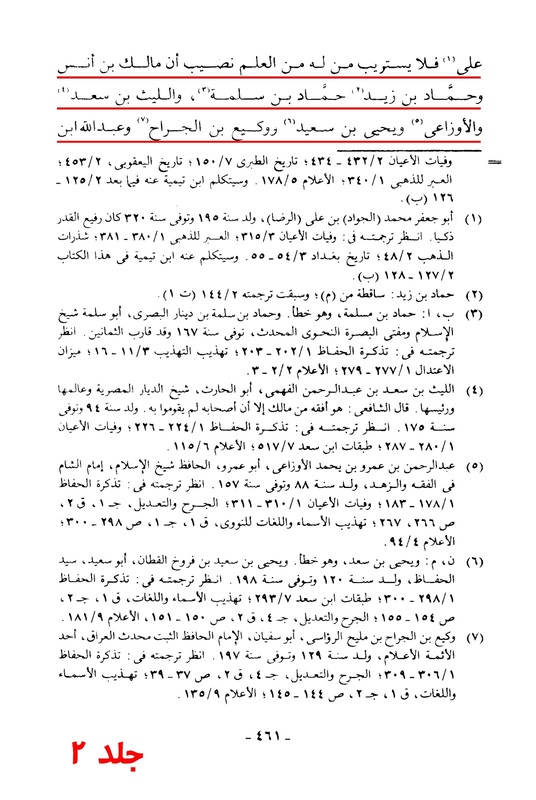 These are the books of hadeeth and the books of tafsir filled with reports from the Sahabah and the Tabi'een. What can be found from Alee (a.s) in them is extremely small. Source: Minhaj Al-Sunnah. Vol. 8, Pg. # 42 - 43. The same Alee bin Abi Talib (a.s) who said, "Ask me about the book of Allah (swt), for I swear there is not a single verse in it except that I know whether it was revealed during the night or day or whether it was revealed in a plain or on a mountain." Narrated from Yahya ibn Sa'eed, "There was not even a single man from the companions of the Prophet (saw) who could say, 'Ask me' except Alee ibn Abi Talib (a.s)." 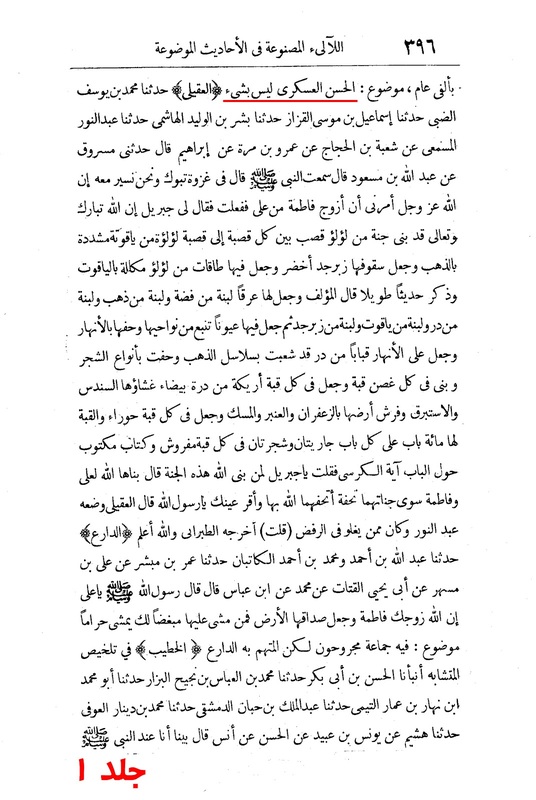 As recorded in Al-Faqeeh Wa Al-Mutafaqih. Vol. 2, H. # 1082 / 1083, Pg. # 351. 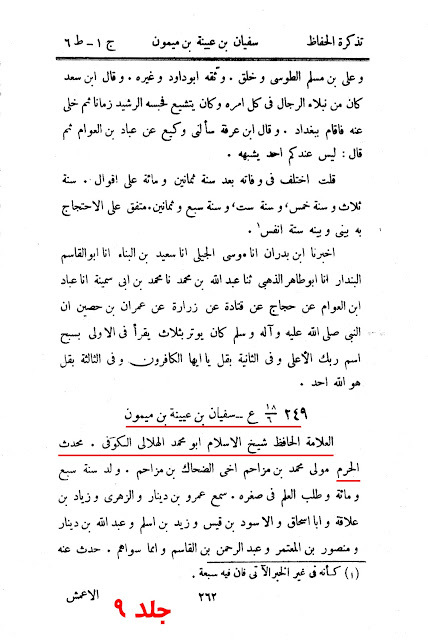 It is rather interesting that some claim during the 6 months period in which Imam Alee (a.s) did not give bayah to the first usurper, he (a.s) was busy collecting the Holy Qur'aan. 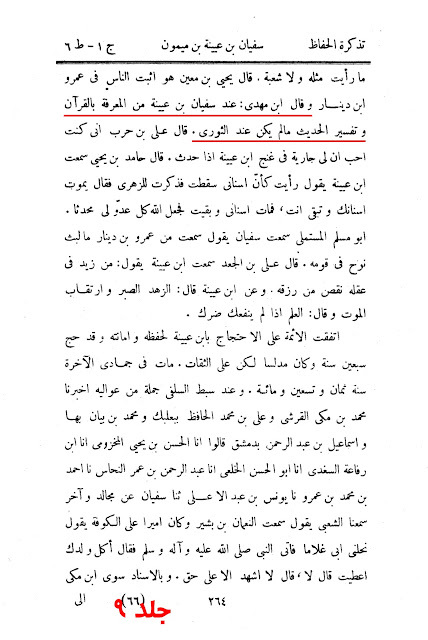 Now, if this had been the case, then why do we find that the Sahabah and/or the Tabi'een take nothing from him? 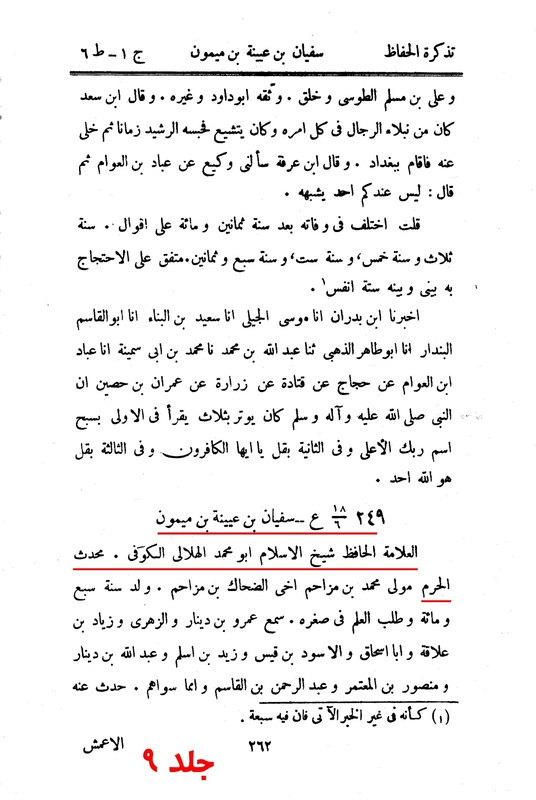 One would begin to question on what basis did ibn Taymiyyah claim the so-called 'Ahl us Sunnah' are upon the aqeeda of the Ahlulbayt (a.s)? "Munkar is what has been narrated by a weak narrator." 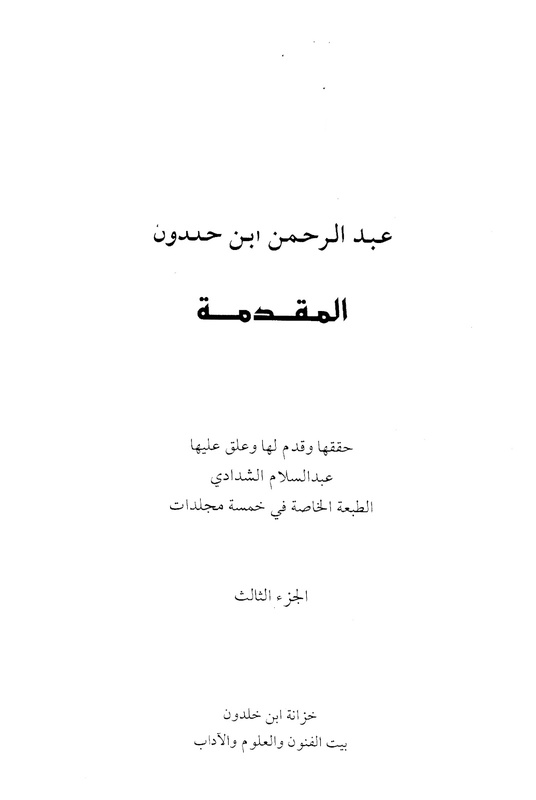 "One whose mistakes are abysmal or his negligence is massive or has showed immorality, his Hadeeth is Munkar." 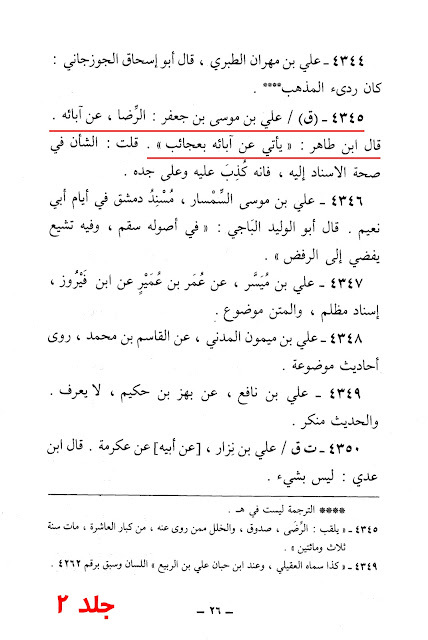 Source: Nukat ala Nuzhat Al-Nazar Fī Tawdīh Nukhbat Al-Fikar. Pg. # 27 / 98. 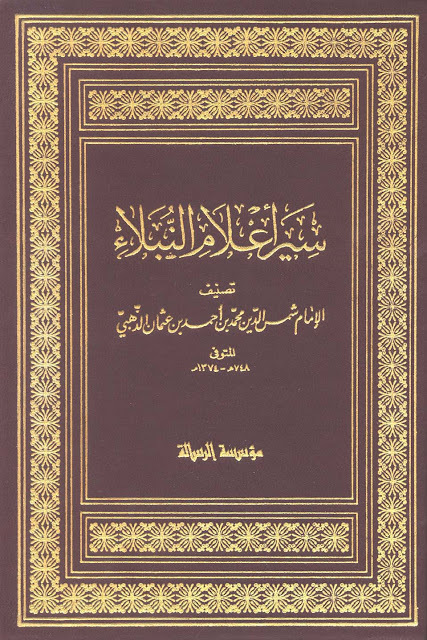 "Ibn Hibban the Hafiz, the Imam, the Allamah, Aboo Hatim Muhammad bin Hibban bin Ahmad bin Hibban bin Mu'adh bin M'aebed bin Suhaid bin Hadya bin Murah bin Saad bin Yazid bin Murah bin Zaid bin Abdullah bin Darum bin Handhala bin Malik bin Zaid bin Munat bin Tamim Al-Tamimi Al-Basti Aboo Sa'ad Al-Edrisi said: 'He was the judge of Samqarand and he was one of the jurists and the preservers of the narrations.' 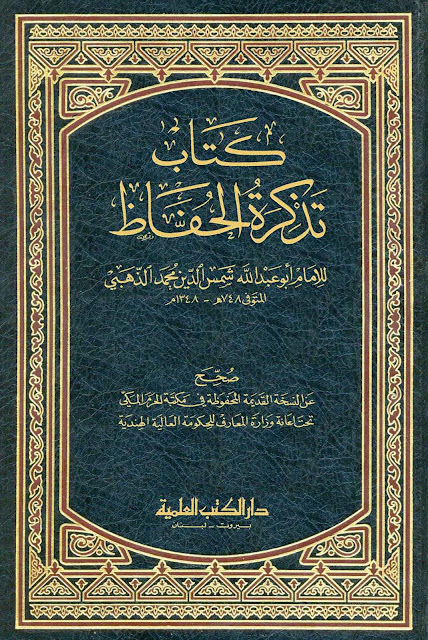 Al-Hakim said: 'Ibn Hibban was a bowl of knowledge in jurisprudence, language, hadeeth and preaching, and he was amongst the sensible men.' Al-Khatib said: 'He was trustworthy, noble and knowledgeable.'" 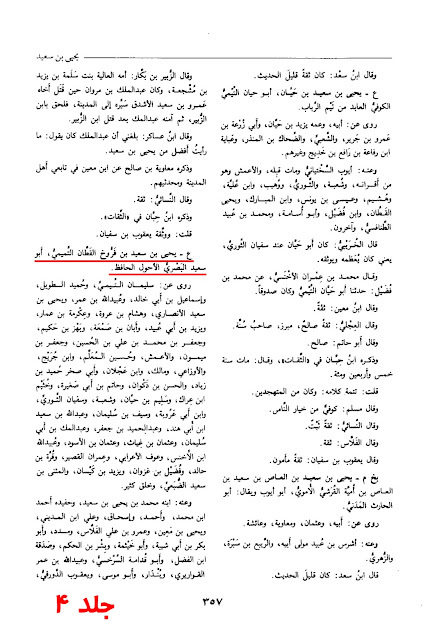 Source: Al-Dhahabi Tadhkirath Ul-Huffaz. Vol. 3, Pg. # 920 - 921. 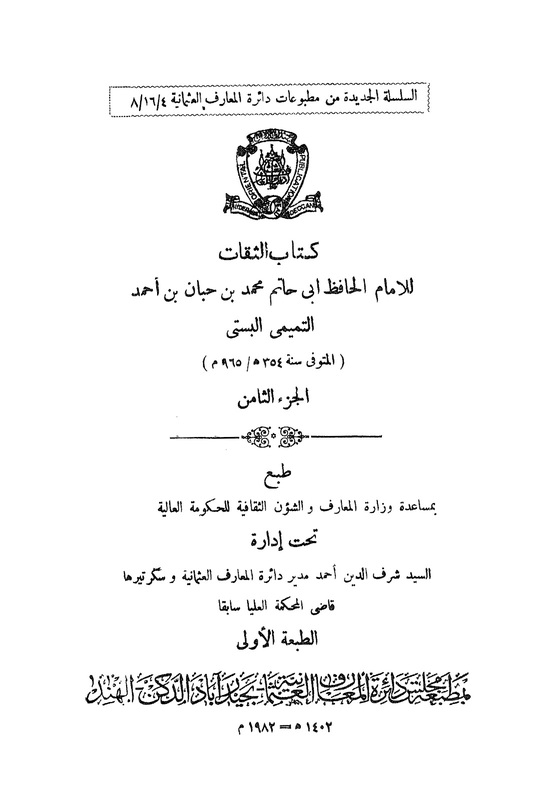 Aboo Hatim Muhammad ibn Hibban ibn Ahmad Al-Tamimi Al-Busti of the well known great scholars and compilers and Mujthideen, he travelled to countries and learned and heard from many scholars, then he became governor of his own district. 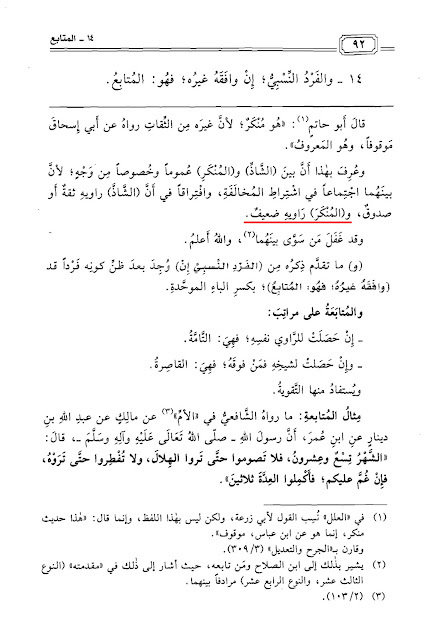 Source: Al-Bidayah Wa'an Nihayah. Vol. 15, Pg. # 281. "His narration (Imam Saddiq (a.s)) is reliable as long as it has been narrated from other than his children, because the reports of his children from him are very much Munkar." 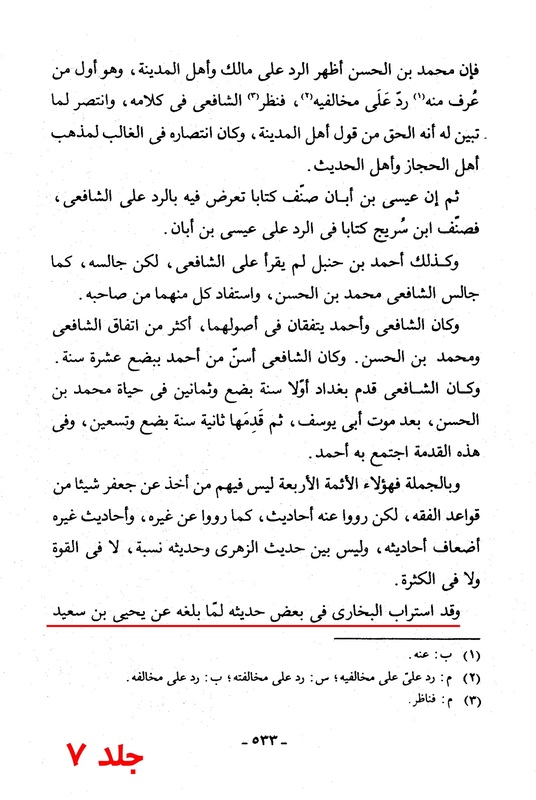 Source: Al-Thuqat (The Authenticated Ones). Vol. 6, Pg. # 131. 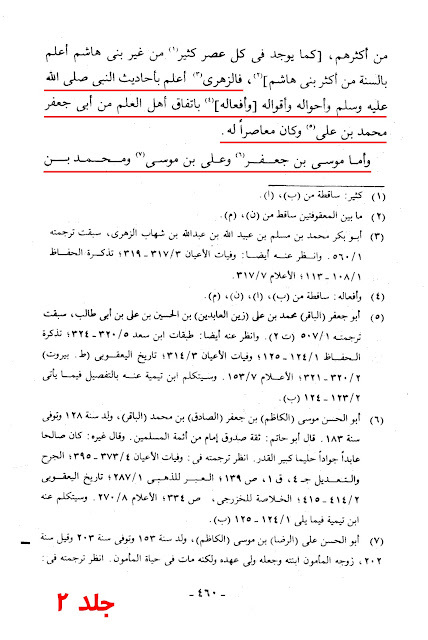 Imam Ja'far Sadiq (a.s) had several sons. The most well known of them being Imam Musa Kadhim (a.s). 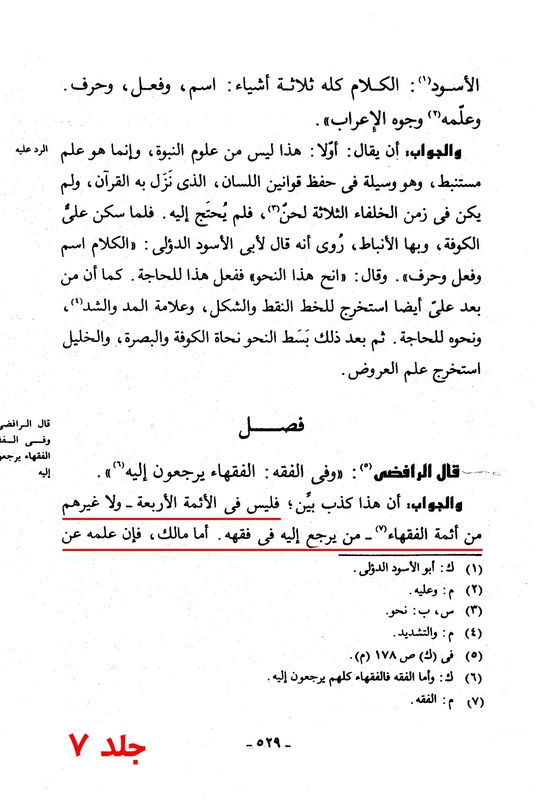 According to ibn Hibban, he is 'Munkar' (Abysmal or showed immorality)! Not only Imam Musa Kadhim (a.s) is Munkar but his grandson Imam Muhammed Taqi (a.s) and the Imams who follow after him are unreliable, and reports from them are to be rejected not to mention their followers. 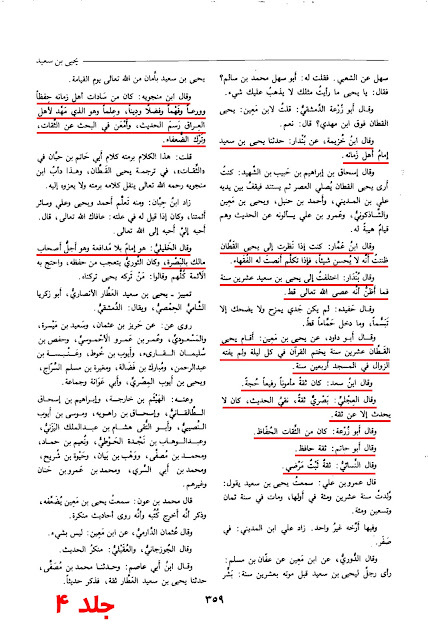 "It is wajib to accept his hadeeth (Imam Redha (a.s)), provided that they are narrated from him by other than his progeny and his Shi'ee, and Abus-Sulat in particular, as the reports narrated from him have such falsehoods in which there is sin from Abus-Sulat and his progeny and his Shi'ee." Source: Al-Thuqat. Vol. 8, Pg. # 452. 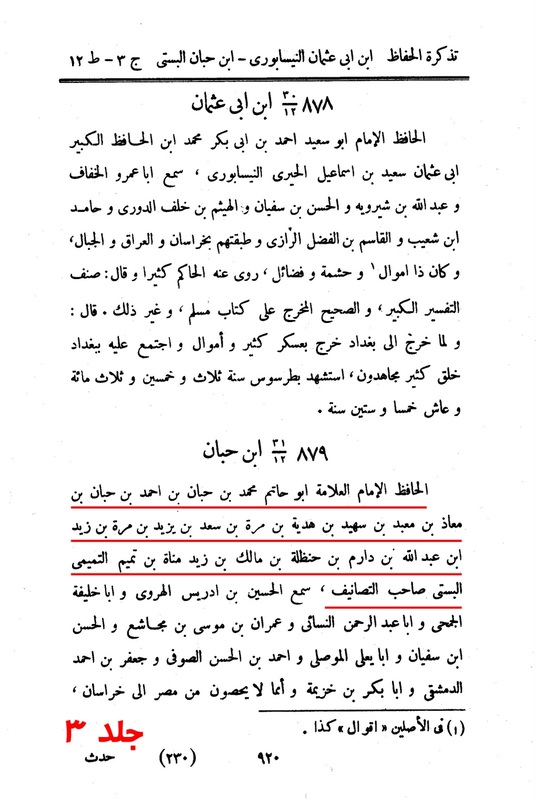 This personality has been rather contraversial, whilst being described a Nasibi by the so-called 'Ahl us Sunnah' he is deemed a Shi'ee by the followers of the Ahlulbayt (a.s). 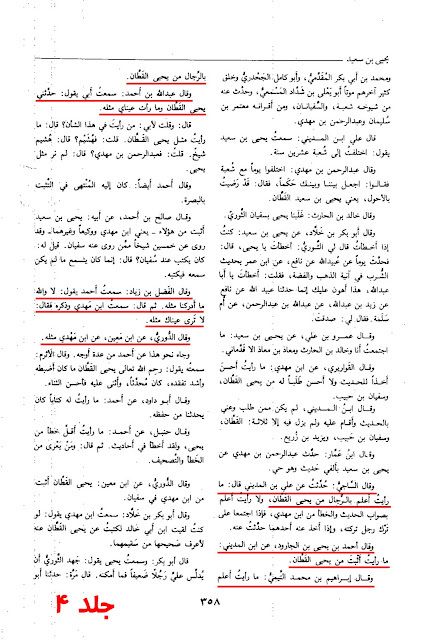 The Nawasib have used this very individual as a defence in order to turn tables to the argument by suggesting that we too accept the trustworthiness of a Nasibi. This rather pathetic attempt has exposed these individuals even more. In order to cover the crimes of their founding forefathers, they have resorted to such cheap tactics and that being of a single individual whom they must have searched day and night for. 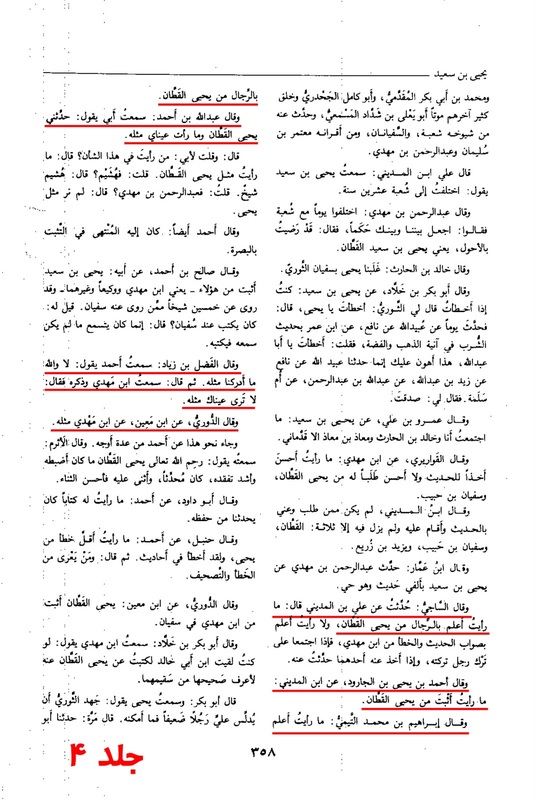 The deceitful method that was used was to mix the statements of Shi'ee scholars those who deemed him Nasibi and those who considered him to be a Shi'ee and Trustworthy and stating this is the opinion of the Shi'ee regarding him i.e. that he is a 'Thiqha Nasibi!' 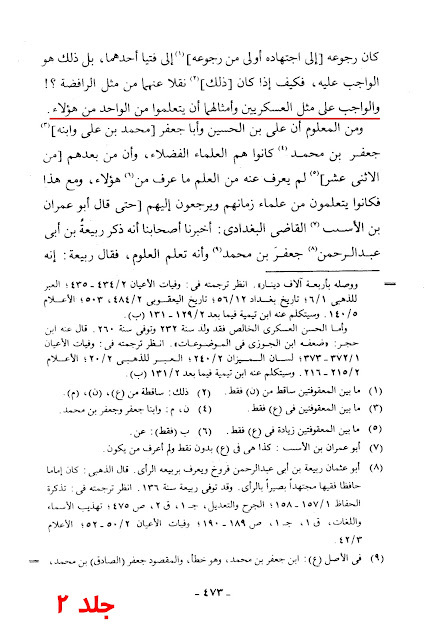 Now, it should be noted as for those (Shi'ee scholars) who authenticated Yahya bin Qattan, none of them recognized him as a Nasibi. It is possible that they did not believe the stories about his Nasb. This is different from the scholars of the so-called 'Ahl us Sunnah' who stated he is a "Nasibi but Thiqah!" 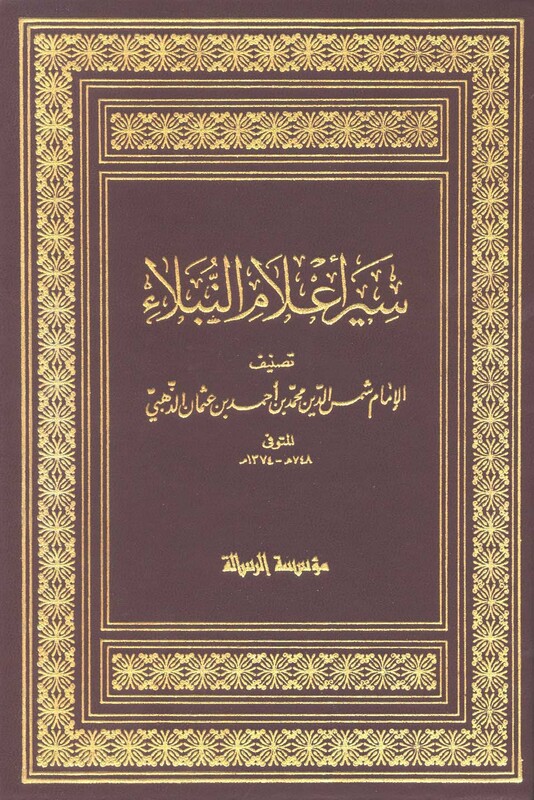 Yahya bin Sa'eed bin Furukh Al-Qatan Al-Tamimi Aboo Sa'eed Al-Basry Al-Ahwal Al-Hafiz Al-Saji narrated from Alee bin Al-Madini said: "I never saw someone more knowledgeable than Yahya bin Al-Qatan in Rijal." Ahmad bin Yahya bin Al-Jarood narrated from ibn al-Madini saying: "I never saw someone who is more Thabt than Yahya Al-Qatan." Ibraheem said: "I never saw someone who was more knowledgeable than Yahya Al-Qatan in Rijal." 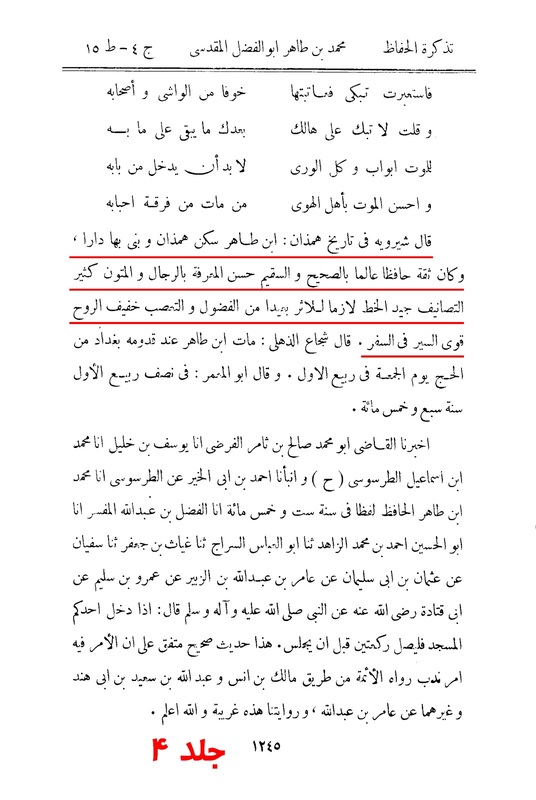 Abdullah bin Ahmad said: "I heard my father saying: 'My eyes never saw someone who is similar to him."' 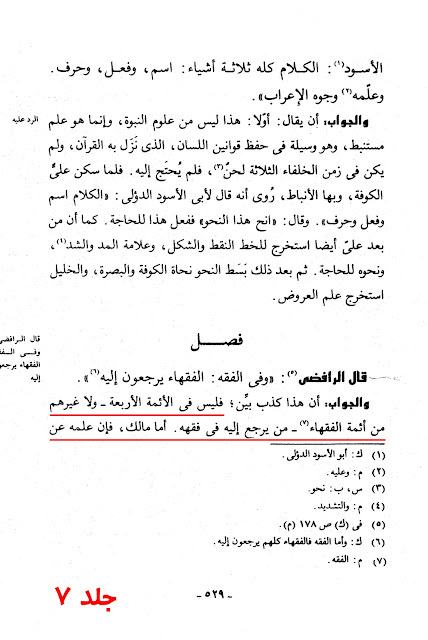 Al-Fadhel bin Ziy'aad said: "I heard Ahmad saying, 'By Allah (swt)! We never met someone who was similar to him." Ibn Al-Mahdi said: "Your eyes can never see someone who is similar to him." 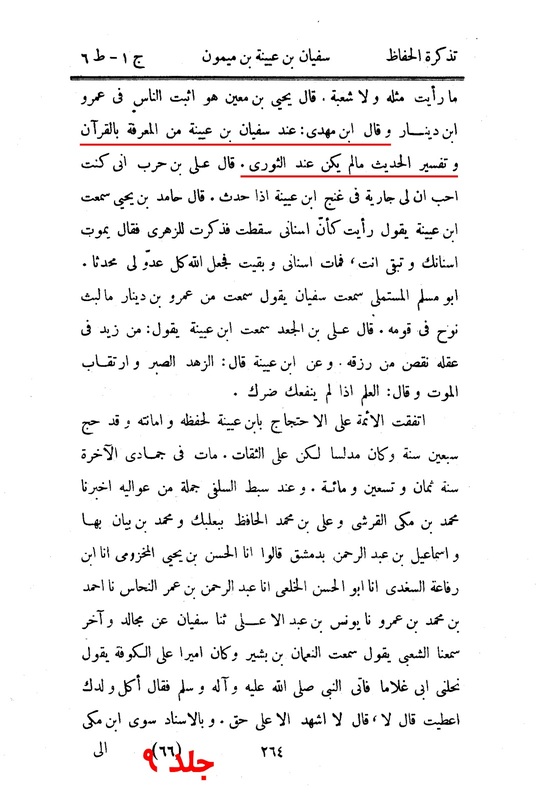 Ibn Khuzayma narrated that Bindar said: "Yahya bin Sa'eed is the Imam of his time." (Ibn Ammar said): "If he talked, the jurist kept listening to him." 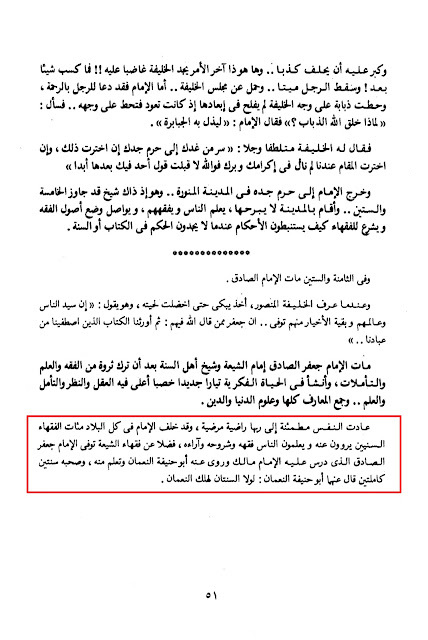 (Bandar said): "I think he never disobeyed Allah (swt)." Aboo Dawood narrated from Yahya ibn Mo'een that he said: "Yahya Al-Qatan used to recite (and complete) Qur'aan every night for twenty years and he never missed performing dawn prayers at the mosque for forty years." Ibn Sa'ad said: "He was Trustworthy, secure, exalted, proof." 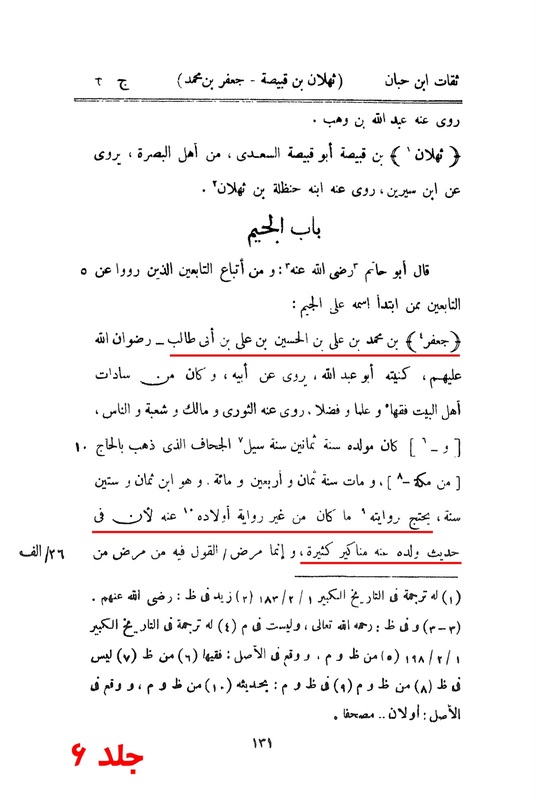 Al-Ijlli said: "He is Basri, trustworthy in Hadeeth, he used to narrate from the reliable narrators only." 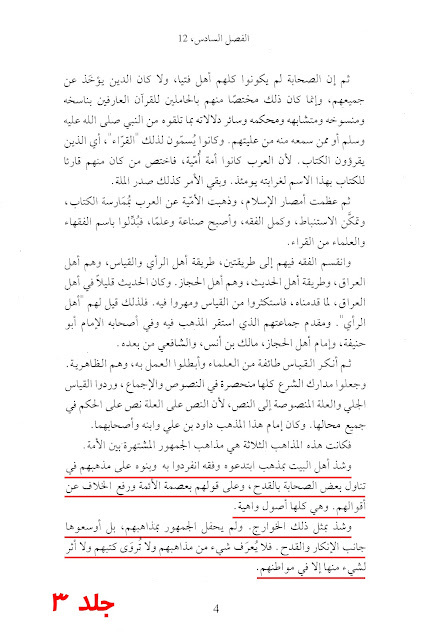 Aboo Zua'ra said: "He was one of the trustworthy and hafiz." Aboo Hatim said: "Proof and hafiz." Al-Nasa'i said: "Reliable, thabt and satisfactory." Ibn Manjweh said: "He was one of the masters of his time, he was hafiz, devoted, knowledgeable, pious, religious and ideal." 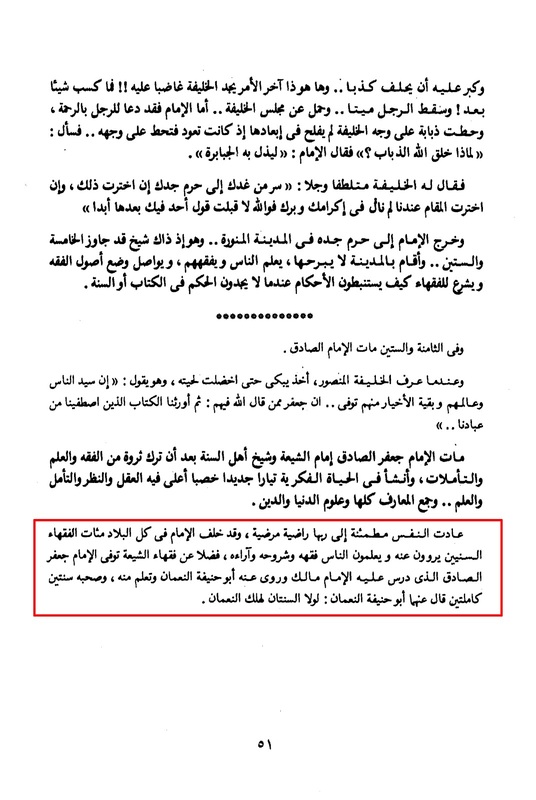 Al-Khalili said: "No doubt he is an Imam and he is the greatest companion of Malik at Basrah." 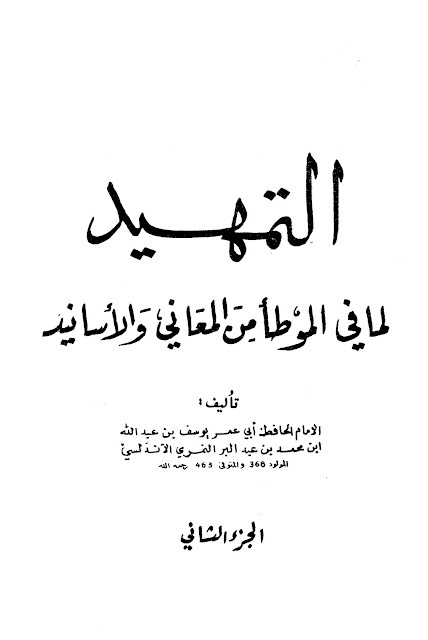 Source: Tahdheeb Al-Tahdheeb. Vol. 4, Pg. # 357 - 359. 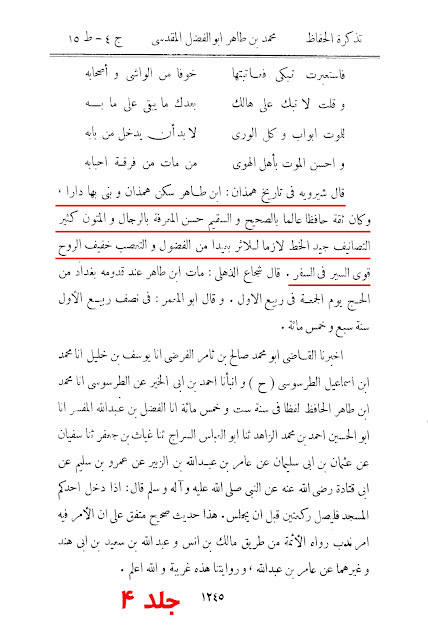 Yahya bin Sa'eed said: "Mujalid is more beloved to me than him (Imam Jaffar Sadiq (a.s)), there is something in my feelings against him (Jaffar)." 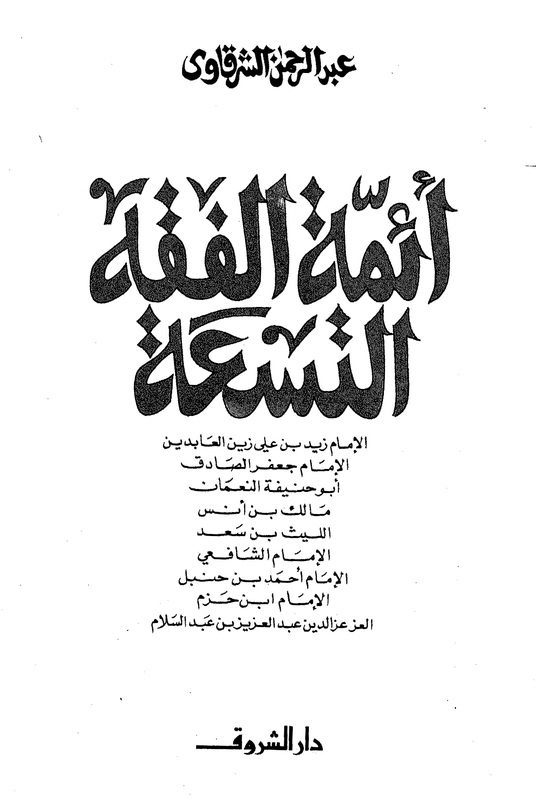 Source: Mizaan Al-I'tidaal. Vol. 2, Pg. # 144. Sufyan bin Uyayna bin Maymoon, 'Hafiz', Sheikh Al-Islam Aboo Muhammad Al-Hilali Al-Kufi, the muhaddith of the Al-Haram (shrine). There were many people who used to go for Hajj and the reason was to meet ibn Uyayna. They used to crowd around him during the season of Hajj. 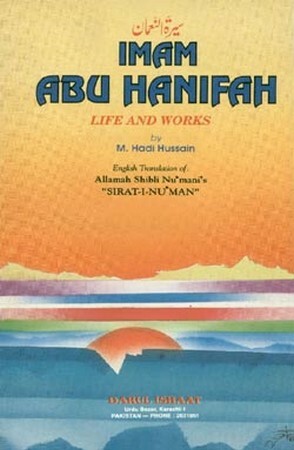 He was an Imam, hujah, hafiz, very knowledgeable and had a great status. 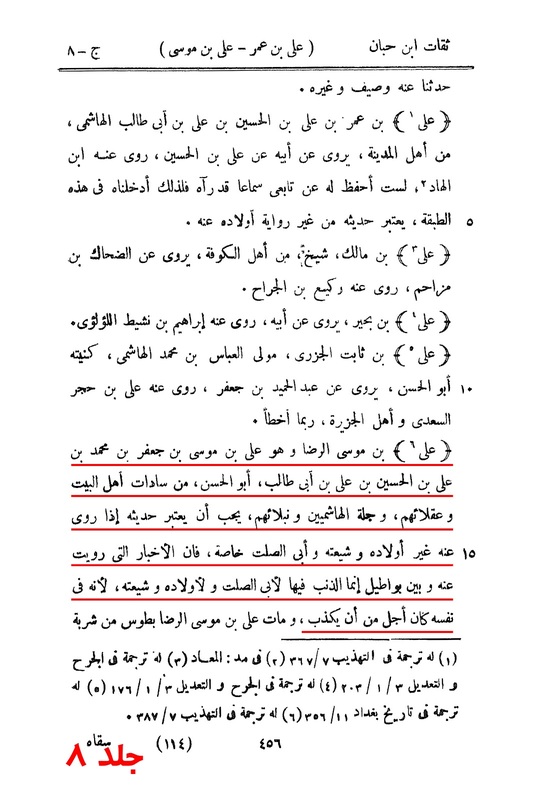 Al-Shafi said: "Without Malik and Sufyan, the knowledge of Hijaz would disappear." 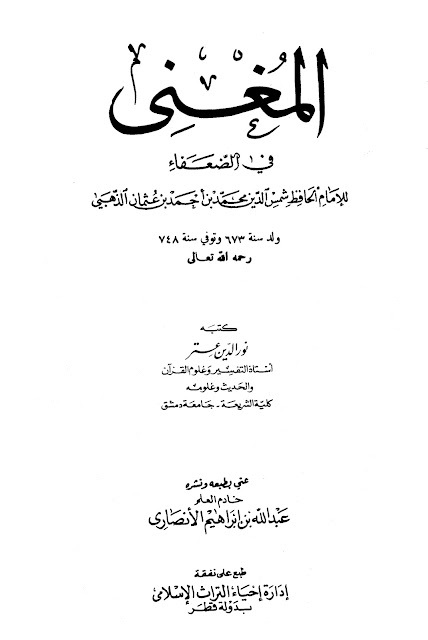 Abdul Rahman bin Mahdi said: "Ibn Uyayna was the most knowledgeable about the Hadeeth of the people of Hijaz." 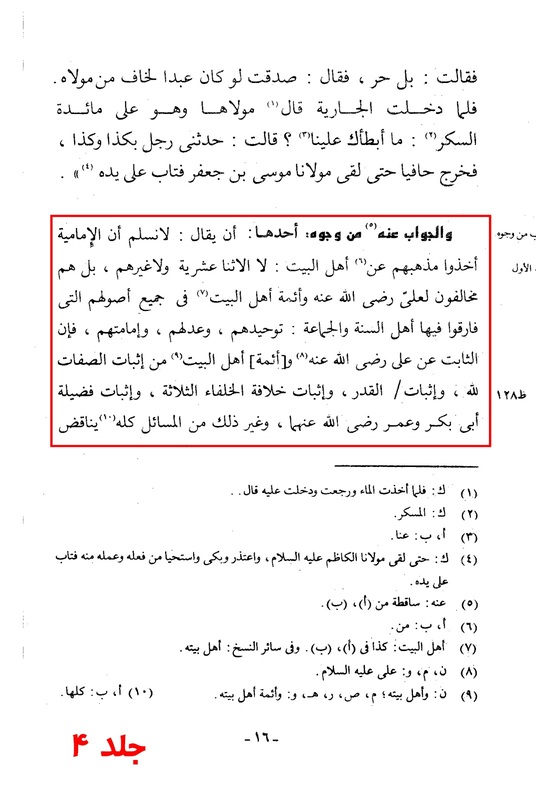 Ibn Wahab said: "I don't know anyone more knowledgeable than him in Tafsir." Ahmad said: "I never saw someone more knowledgeable than him in the Sunan." Al-Ijlli said: "Ibn Uyayna was Thabt in Hadeeth." 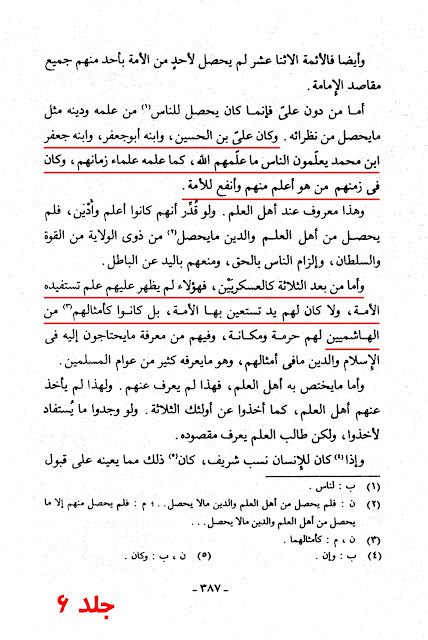 Bin Mahdi said: "Sufyan had knowledge about Qur'aan and Hadeeth which Al-Thawri didn't possess." 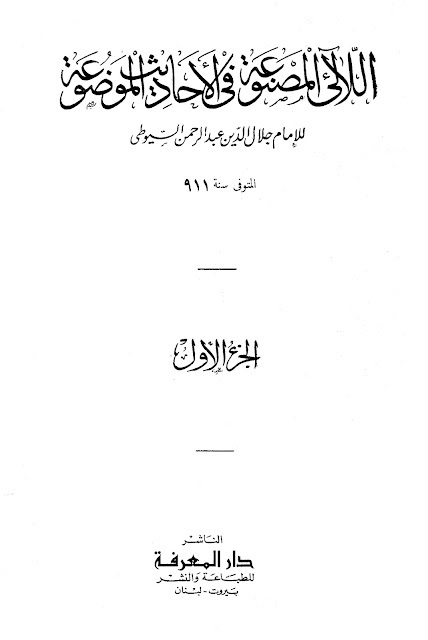 Source: Tadhkirah Al-Huffaz. Vol. 9, Pg. # 262 - 263, Person # 249. Ibn Uyaina said under the Chapter of, Ja'far ibn Muhammad ibn Alee bin Hussain ibn Alee bin Abi Talib (a.s): "There was some thing in his memorizing." Source: Al-Tamheed. Vol. 2, Pg. # 66. 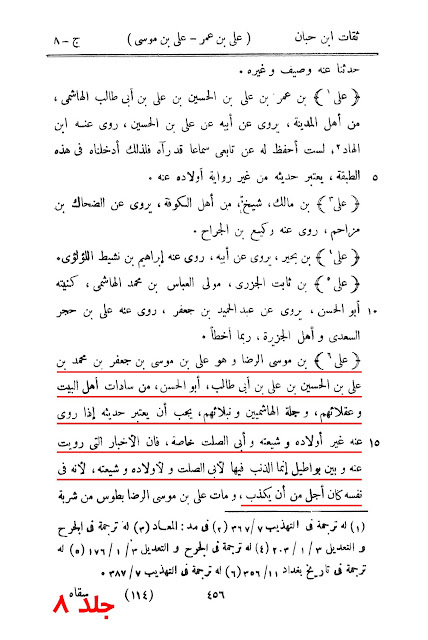 Sufyan said: "We used to laugh at the Hadeeth obtainer if he went to three, Rabi'a, Muhammad bin Abi Bakr bin Hazm and Jaffar bin Muhammad (a.s) because they were not good in Hadeeth." 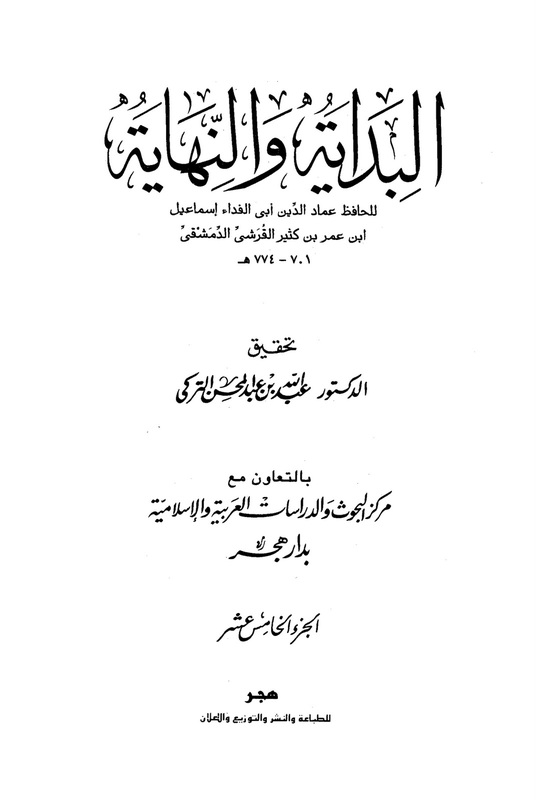 Source: Siyar Alam Al-Nubala. Vol. 6, Pg. # 572. 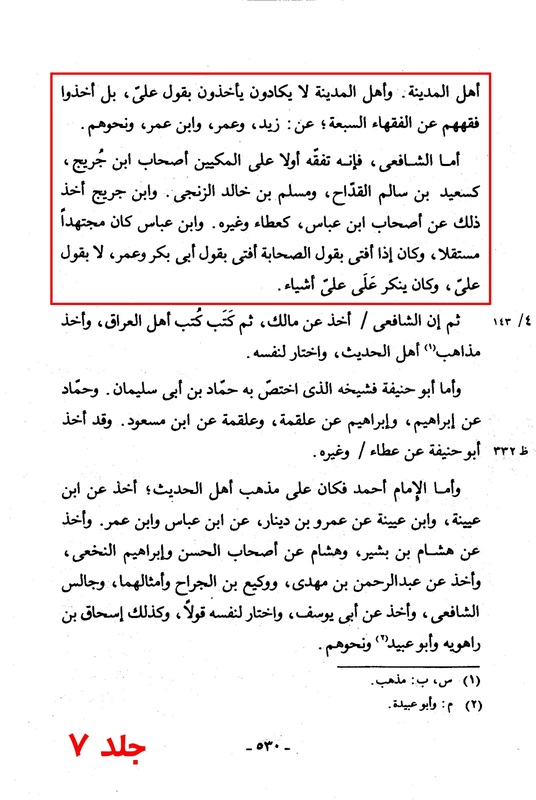 Ibn Hajar Asqalani said in regards to ibn Sa'ad said: "He (Imam Sadiq (a.s)) used to narrate a lot, but not reliable and is considered weak." Source: Tahdheeb Al-Tahdheeb. Vol. 1, Pg. # 311. 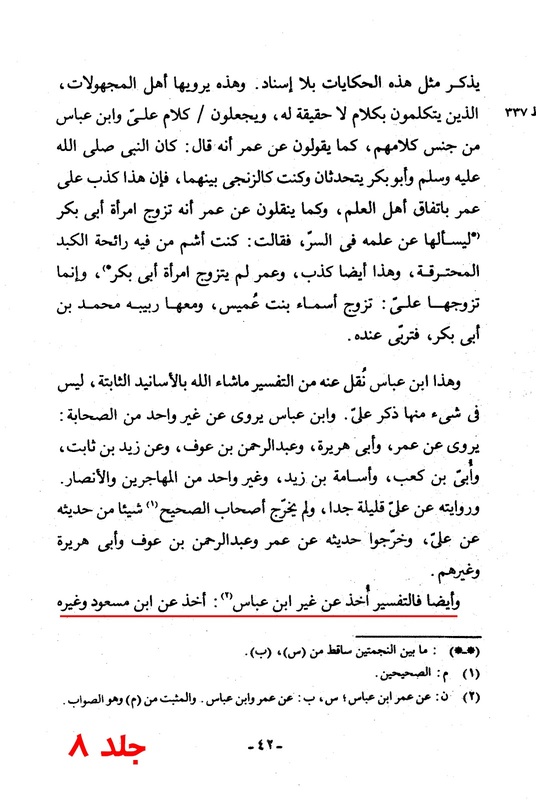 Muhammad bin Tahir bin Alee, "The hafiz the scholar, the mukthir (who narrates a lot of hadeeth) the jawal (who travels a lot)." 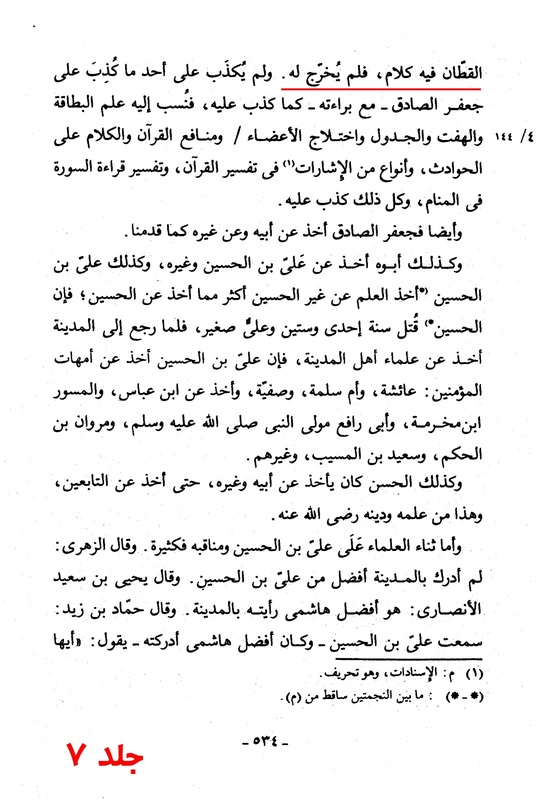 Aboo Al-Fadhil Al-Maqdisi, known as ibn Al-Qaysarani Al-Sheybani Aboo Al-Qasim bin Asaker said: "I heard the hafiz Muhammad bin Ismail saying: 'The best hafiz I ever met is ibn Tahir. '"Aboo Zakariya bin Mandah said: "Ibn Tahir was one the hufaz, possessed good beliefs, nice attitude, truthful, extremely knowledgeable in the correct and false (hadeeth), used to write alot, follower of 'athar' (Tradition)." Al-Sam'ani said: "I asked Aba Al-Hassan Al-Karkhi the jurist about ibn Tahir, he replied: 'There is no one on the face of earth who is similar to him.'" 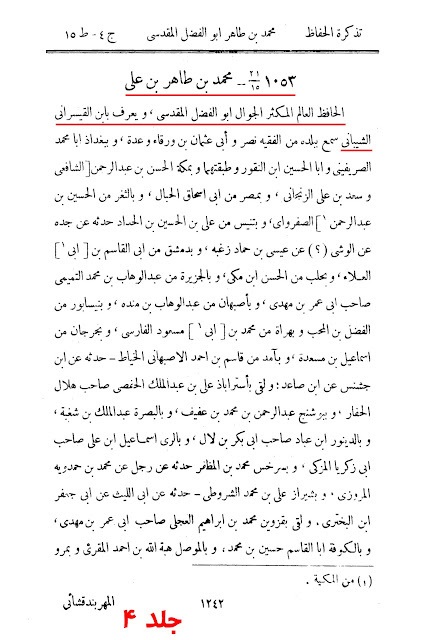 Ibn Shereweh said in 'Tarikh Hamadan' that bin Tahir lived in Hamadan and built a house there. 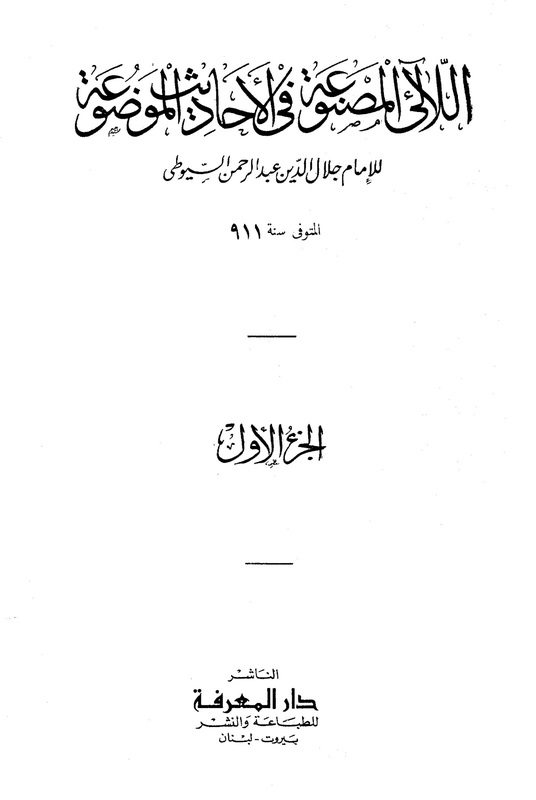 He was Thiqah, hafiz, extremely knowledgeable in correct and false (hadeeth), well known in Rijal and texts, used to write alot, had good hand writing, follower of 'athar' (tradition), far away of curiosity and bigotry, was humorist and strong in travelling." 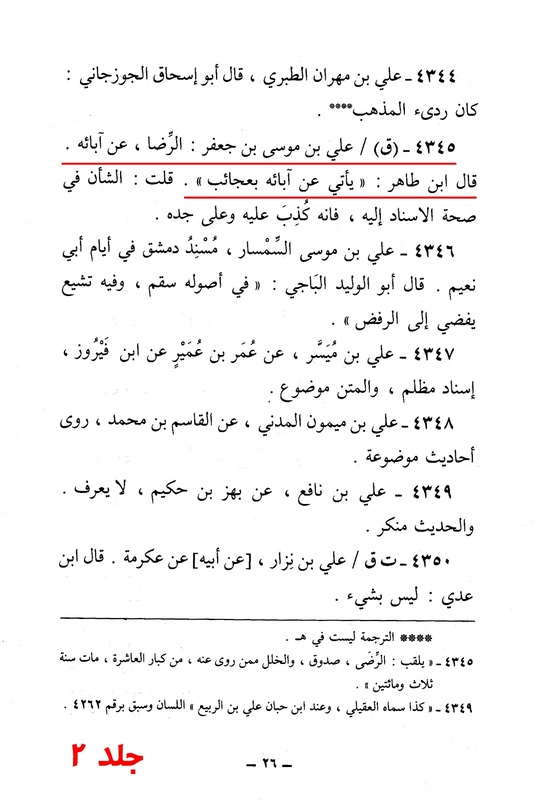 Source: Tadhkirat Al-Huffaz. Vol. 4, Pg. # 1242/1243/1435, Person # 105. Ibn Al-Tahir says, "(Muhammad) Al-Jawad (a.s) used to narrate strange (narrations) from his father." 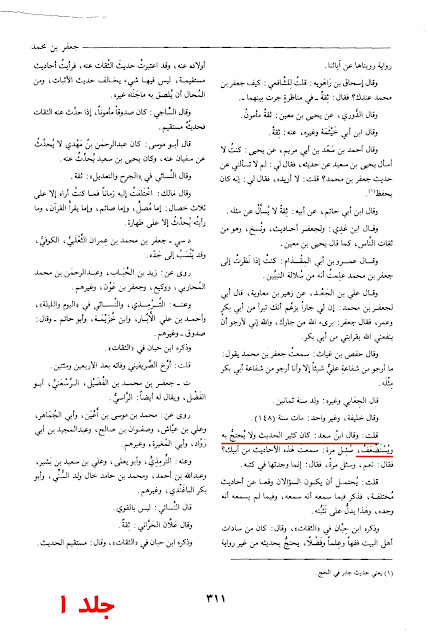 Source: Al-Mughni Fi Al-Dhu'afa. Vol. 2, Pg. # 26, H. # 4345. 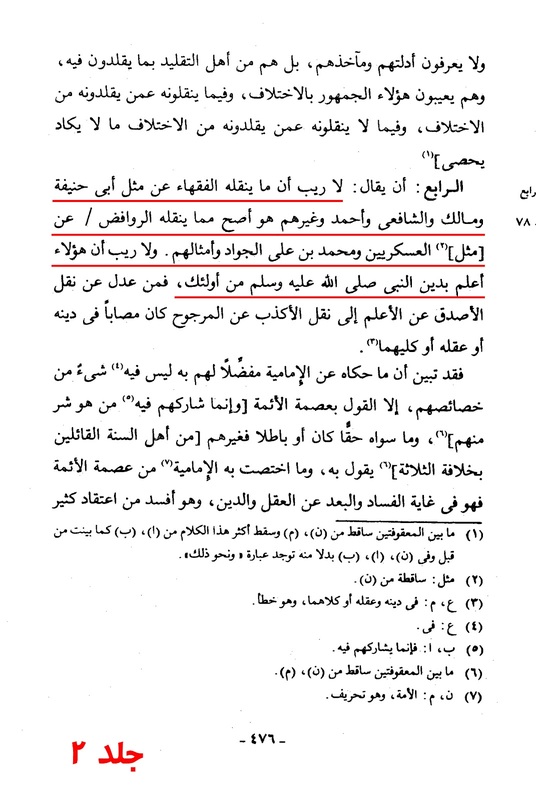 Musa'ab ibn Abdullah said: "Malik would not narrate from Ja'far (a.s) until he linked it with those narrators who are high. 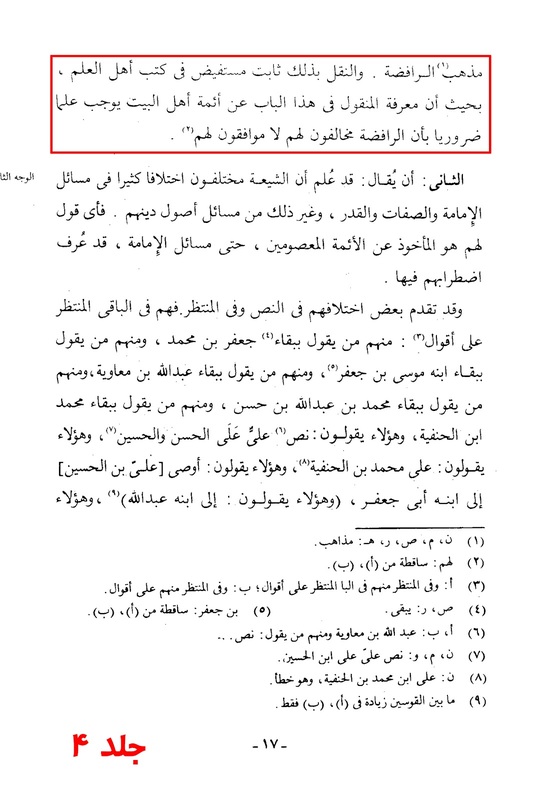 Then he would put Jaffar's (a.s) narration after it." 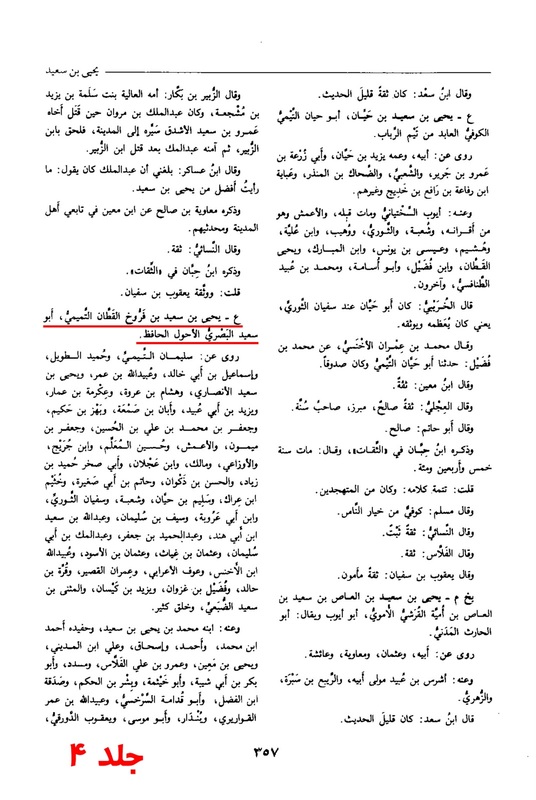 Source: Mizan Al-I'tidal. Vol. 2, Pg. # 133, Person # 1021. 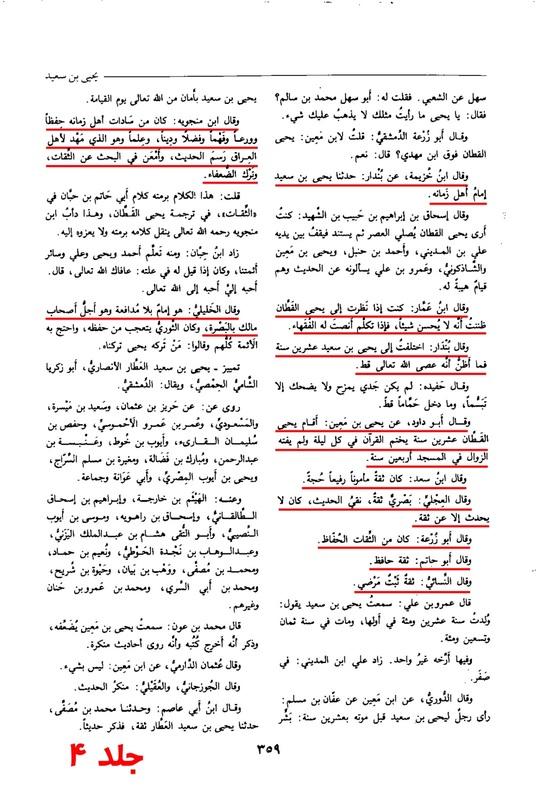 "…and the Ahlulbayt (a.s) deviated by created sects that they formed, and fiqh that they came up with by themselves, which they built upon attacking some of the sahaba, and by saying that the Imams (a.s) are infallible and all that are baseless. They matched the Kharji, and the general public of Muslims did not celeberate or endorse such sects, but rather denied them. So we do not recognise their sects, nor do we narrate anything from their books. Their narrations have no impact except in their own lands like Yemen, Morocco and the East." 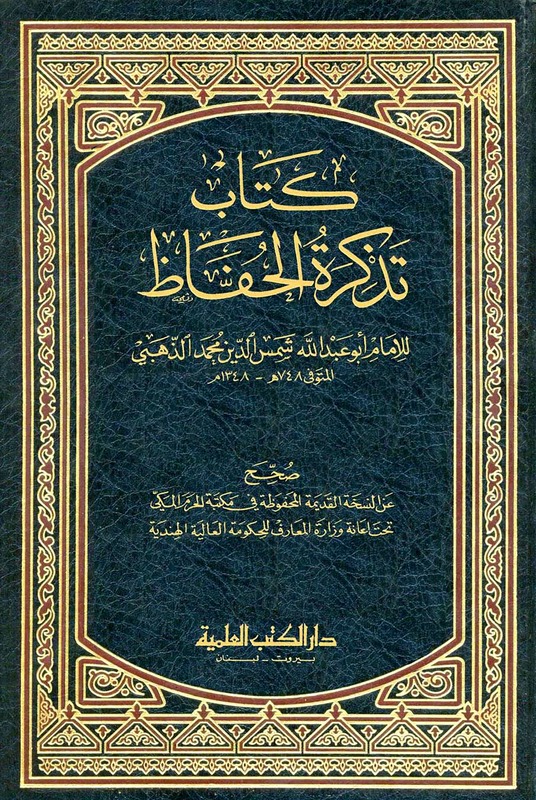 Source: Al-Muqadma. Vol. 3, Pg. # 4 - 5. "Al-Hassan Askari (a.s) is worth nothing." Source: Al-La'i Al-Masnu'a Fi Hadeeth Al-Maudu'a. Vol. 1, Pg. # 396. 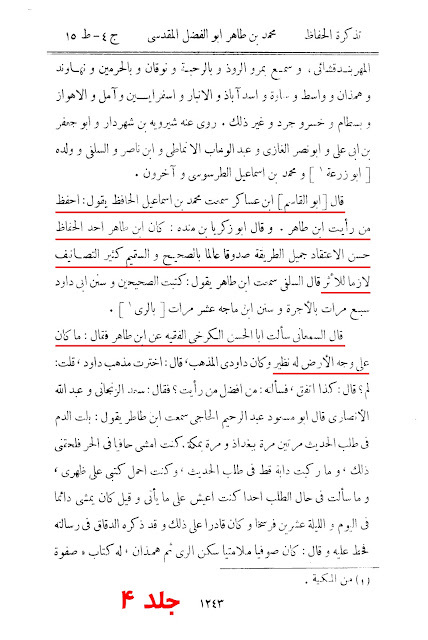 If one excuses these are mere differences based on the opinions of certain scholars regarding the Imams of the Ahlulbayt (a.s), then why are all the companions exempt from this very rule? 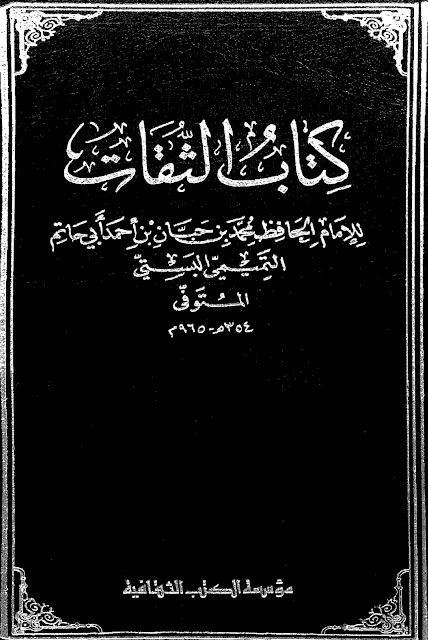 When one looks at the books of the followers of the Ahlulbayt (a.s), they will find narrations that can be traced back to the Imams (a.s). 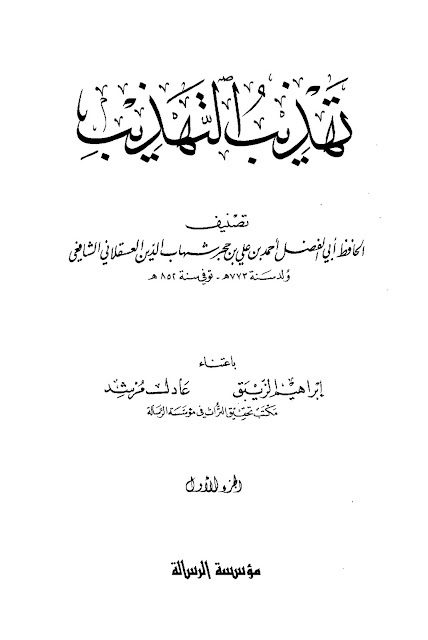 However, the so-called 'Ahl us Sunnah' on the other hand accept Hadeeth on the authority of those very individuals, the 'Kharijis and Nasibis' who would narrate narrations which would discredit the Ahlulbayt (a.s) only to favour their ideology and in turn, deem their narrations authentic. 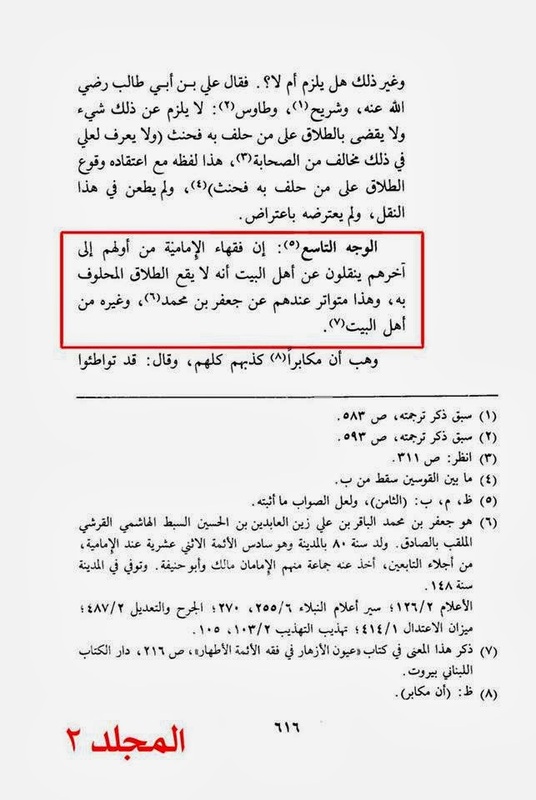 Verily, the jurists of the Imamiyyah, from the first of them to the last, narrate from the Ahlulbayt (a.s) that divorce by swearing is not valid and this is mutawatir among them from Jaffar ibn Muhammad (a.s) and others from Ahlulbayt (a.s). 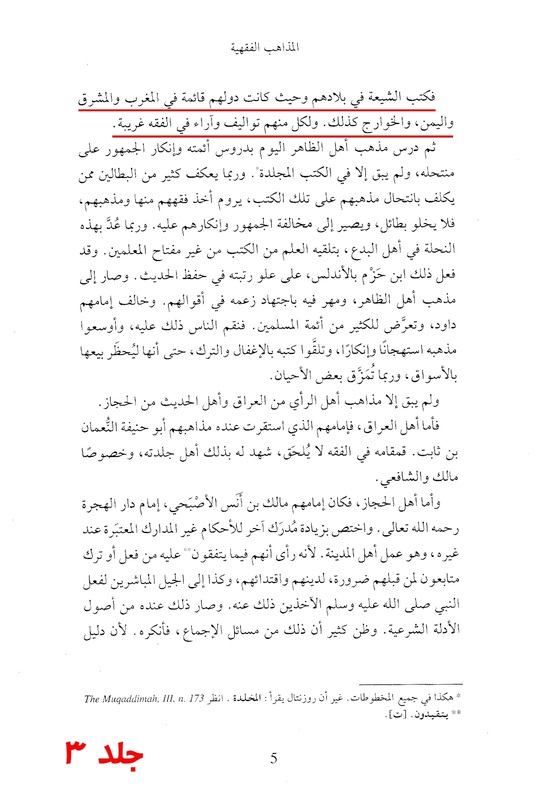 Source: Al-Sawa’iq al-Mursalah ‘ala al-Jahmiyyah wa al-Mu’atillah. Vol. 2, Pg. # 616. In other words, what the Shiah Imamiyyah have recorded from the twelve Imams of the Ahlulbayt (a.s) in their books are true. They are authentic words of the Imams of the Ahlulbayt (a.s). 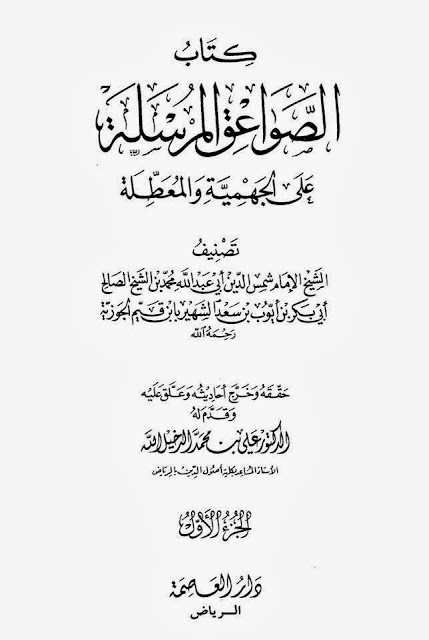 Hadeeth al-Thaqalayn is perfect evidence that the Aqidah and fiqh of the Shiah Imamiyyah connect directly to the Messenger of Allah (saw). As long as a Shiah strictly follows the teachings of the Ahlulbayt (a.s), he is without doubt on the Straight Path of Allah (swt), and is path of the Jama’ah. Whosoever deviates from the Ahlulbayt (a.s), whether he calls himself a Shia or otherwise, is in clear misguidance and will end up in Hellfire. The choice whether one enters Paradise or Hellfire is entirely in his hands. If one follows the Ahlulbayt (a.s), he will be in Paradise. If he does not, he has voluntarily chosen Hellfire. May Allah be pleased with you. Inshallah 'tala Thank you for your kind words as always.